1/ Amazigh place-names, having undergone little or no alteration, including, a) existing, b) slightly altered, and c) vanished. 2/ Altered and/or translated Amazigh place-names: a) Arabicized or ‘Frenchified’; b) other categories. 3/ ‘Hispanised’, ‘Frenchified’, or historically altered place-names. 4/ Some facetiously interpreted place-names. 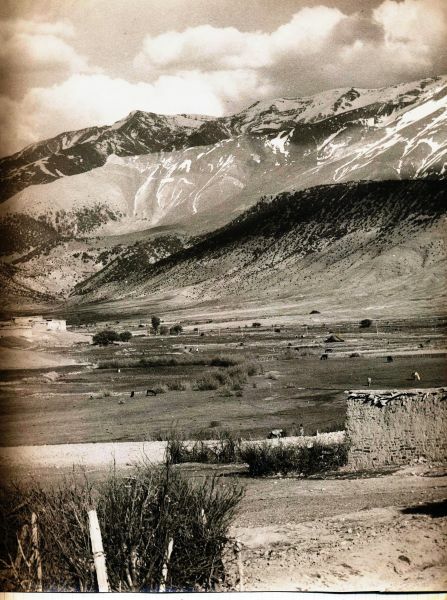 a) Existing Almou n-Ayt Ndhir, meadow in Tâarâart valley, High Atlas < almu n ayt nðir, ‘pasture of the Beni Mtir’. Assamer n-Ou Ilourhmane, mountain on south side of Jbel ‘Ayyachi < assamer n iluġman, ‘south slope of the camels’. Assif Melloul, river in Ayt Hadiddou, High Atlas < asif mellul, ‘white river’. Some claim this is due to its being a snow-fed river, hence ‘white’; others contend that real name was Asif Abkhouch (‘black river’), on account of its frequent devastating floods and was renamed ‘white’ as a propitiatory gesture. Assif Tasfelalayt, a river in Ta’ara’art valley (Jbel Ayyachi), ‘shining river’ < asfelaly, ‘shining, shimmering’. 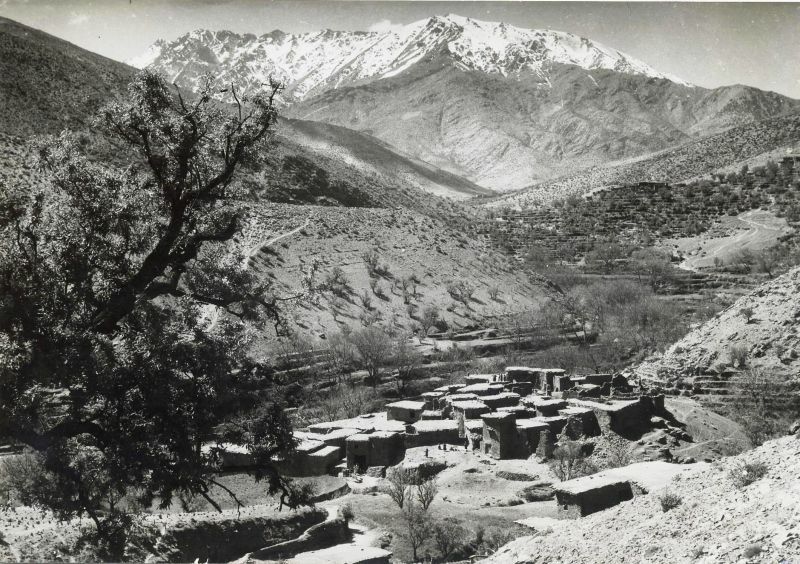 Azaghar, general name given by High Atlas Berbers to the Marrakech or Tadla plain, or by Zaïan tribe to their lowland grazing-grounds < azaġar; also diminutive form, Tazaghart, name of an important flat-topped mountain in Toubkal area. Rare view of Lake Izoughar with water in it, Ighil Waougoulzat (top), Apr. 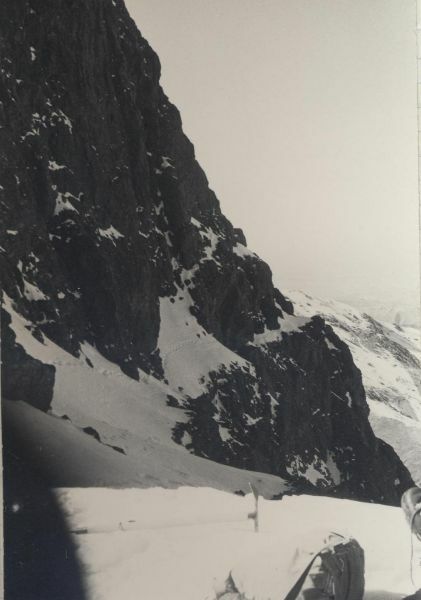 1966 (photo: M. Peyron; poor definition, taken with a Kodak ‘Instamatic’ camera!). There is a plural form, Izoughar (< izuġar), semi-permanent lake and expanse of flat ground near Ayt Bou Gemmaz. The lake dries up by end-June and you get those classic TO brochure views of their clients (un)happily crossing its dusty surface in summer! Azrou, town and road-junction, Beni Mguild area, Middle Atlas < azru, ‘rock’. 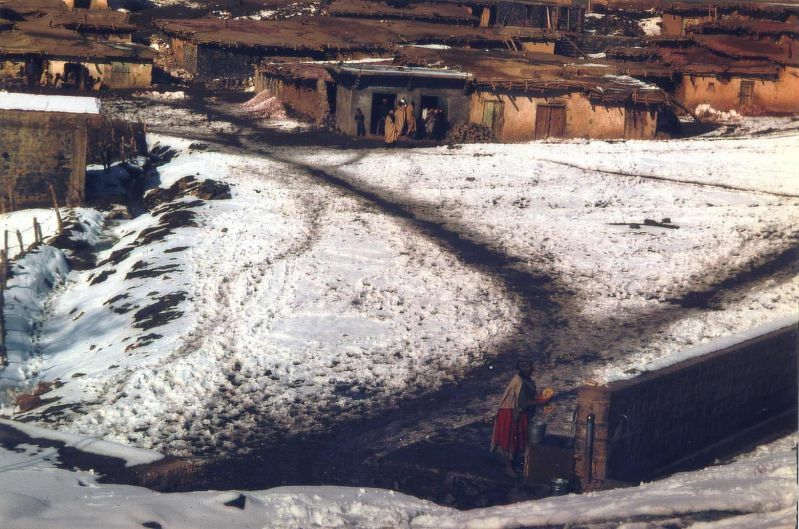 Bou Tserfine, village in Ayt Yahya, Eastern High Atlas < bu tisrfin ‘place of grain-pits’. Boutferda, village in Ayt Sokhman, bu tferda, ‘lonesome spot’ < aferdi, ‘solitary, lonesome’. Boukchmir, site of Forestry Hut on upper Oued Beth < bu wqšmir, ‘place of the cliffs’. 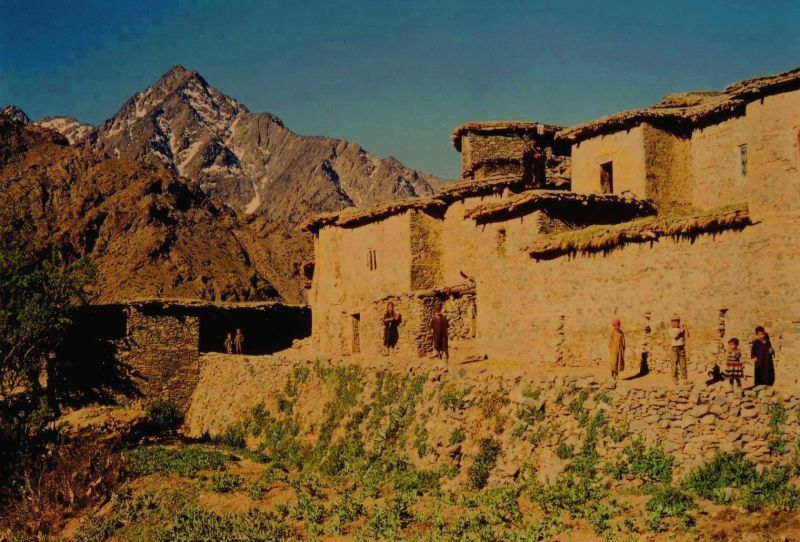 Imilchil, town in Ayt Hadiddou, High Atlas < imi n lšil, ‘grain gateway’; Place where southern tribes regularly used to come to buy grain. 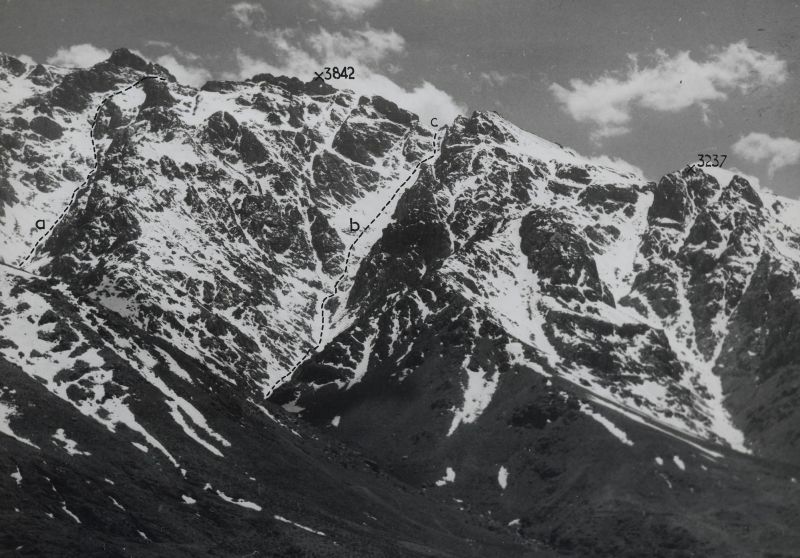 Jbel Ayyachi, highest mountain in central Morocco, ‘mountain of Ayyach’, tribal name < εari u εayyaš. Jbel Tassemite, hill above Beni Mellal, regularly sow-covered in winter and early spring, ‘cold mountain’ < asemmiḍ, ‘cold’. Jbel Tazizawt (Tazigzaout), wooded hill in Ayt Sokhman, south of Aghbala, ‘green mountain’< tazizawt ; because of the extensive vegetation that covers it. Another interpretation is that name refers to green (azizaw, azegza) turbans of the Derqawa sect, to which Sidi Lmekki belonged, in connection with the famous battle that occurred there. Tiffert, village on Oued el Abid; Taffert, hamlet in Bou Iblane, ‘the hidden one’< verb ffer, ‘to hide’. Tiouririne, small hills’ < tiwririn (sing. tawrirt). Ti n Melwit, ‘Moulouya country’, name given to land between Azerzou and Alemsid near Moulouya head-waters. Tounfit, ‘remote one’, small foot-hill town, Eastern High Atlas < verb nfu, ‘to exile’. Aïn Ifendassen, spring south of Bou Iblane, litt. ‘spring (where) he escaped from them’ < ifend asn < ifelt asn; probably commemorates some incident where a prisoner parted company with his captors. Jbel Mouchchene, between Tiddas and Oulmès, central Morocco, ‘jackal mountain’ < žbel muwuššan. 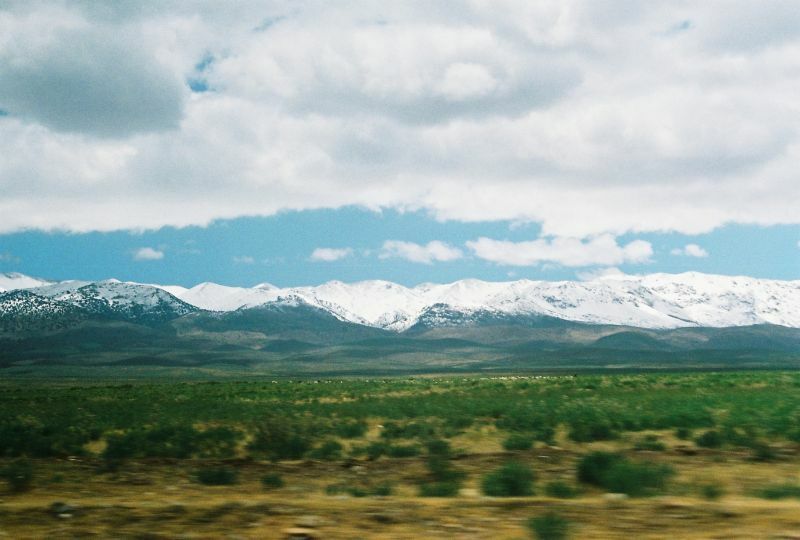 Tinmal, in upper Nfis valley, High Atlas < ti n mellel, ‘the white one’, a reference to the presence of snow in winter; radical ML (‘white’) present in numerous other Amazigh place-names, Imlil, Titi Mellil, Tizi n-Toumlilt, Tizi Melloul, Ayt Tamellilt, Aïn Amellal, etc. As instances of other slightly deformed place-names we have: Moulay Idriss > mulay dris; Aït Ishaq > ayt shaq, reflecting Amazigh pronunciation. Also, Afennourir, lake above Azrou, famous ornithological site for migratory birds < ixf n awrir, ‘head of the mount’. Aghmat, ruins some 10 kilometres south-west of Marrakech at entrance to Ourika valley, former regional capital, supplanted by Marrakech. Until half a century ago, some Shelluh still used to refer to Marrakech as Aghmat. Aguz, or Kuz, former Atlantic port of Aghmat at mouth of Tansift river. Day, former name of Beni Mellal; capital of independent 11th-century Zenata princedom. Errachidia, provincial capital of south-east Morocco, formerly Ksar es Souk < iġrem n ssuq. Goulmima, south-east Morocco, and Goulimine, south-west Morocco, Arabized plural forms both < igulmimn (sing. agelmam), ‘semi-permanent lakes’. Kasbat al-Makhzen, former name of Ksabi, founded by Moulay Ismaïl on Moulouya river. Lemsid, instead of Alemsid; attempted Arabisation, alemsid actually reflecting colour of terrain and nothing to do with the msid in a mosque! Mohammedia, Atlantic seaport, formerly Fedhala < Fidela < fadl allah in medieval times. Sijilmassa, ruins near present-day Erfoud or Rissani, former capital of small medieval kingdom famous for trans-Saharan trade. 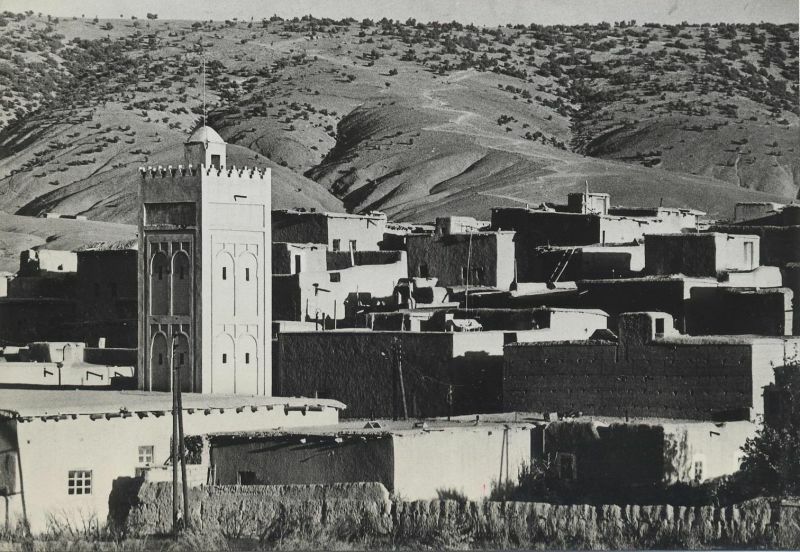 Tafza, medieval town of some importance on one of Oum er Rbia’s L-bank tributaries, mentioned in Leo Africanus; now refers to small hamlet near Jbel Tazigzaout, associated with local epic of Imhiouach marabouts. Tamesna, ‘next to sea’ in old Berber, former name of Chaouia region until 19th century. 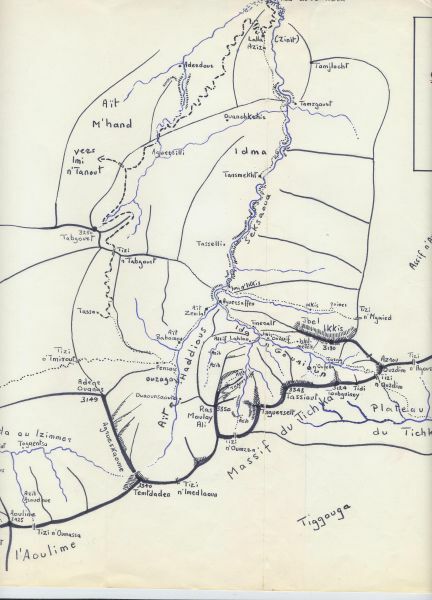 Wansifn, former name of Oued Oum er Rbia, major Moroccan river < wi n isaffen, ‘the river among rivers’; note that Tansift, smaller river just north of Marrakech, bears diminutive/feminine form. Yeffren, Middle Atlas town, instead of Ifrane < ifran, ‘caves’ (sing. ifri); famous attempt to de-Berberize a place-name which caused an uproar at the time. a) Arabized, or ‘Frenchified’ Agelmane Laaziza, above Khenifra in Middle Atlas; reflects attempted Arabisation of place-name, instead of agelmam aziyza, ‘green lake’. Aïn Taoujdate, forest spring near Ifrane, Middle Atlas; probably translated from taġbalut n tawjdat, ‘source of female Barbary sheep’. 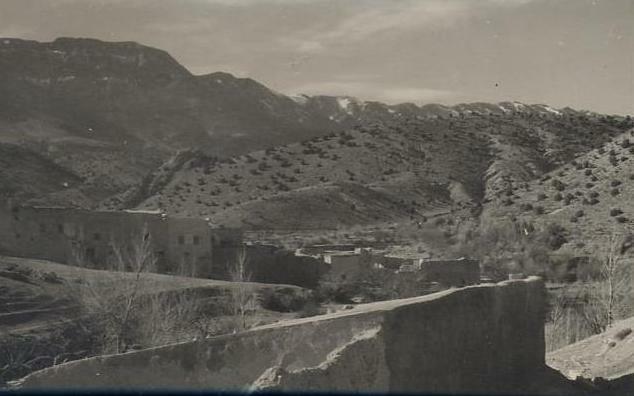 Baqria, Middle Atlas village, reflecting unofficial, Arabised version of Baqrit (Bekrit). Give-away for Arabisation is usually substitution of /a/ for /t/, as in Zawiya Sidi Yahya ou Youssef < zawit sidi hya w yusf. Bin el Ouidane (local pronunciation bilwidan), river-junction and site of famous reservoir above Beni Mellal; probably translated from Amazigh gr isaffen, ‘between rivers’; incidentally, this is name of village in Upper Seksawa, High Atlas. 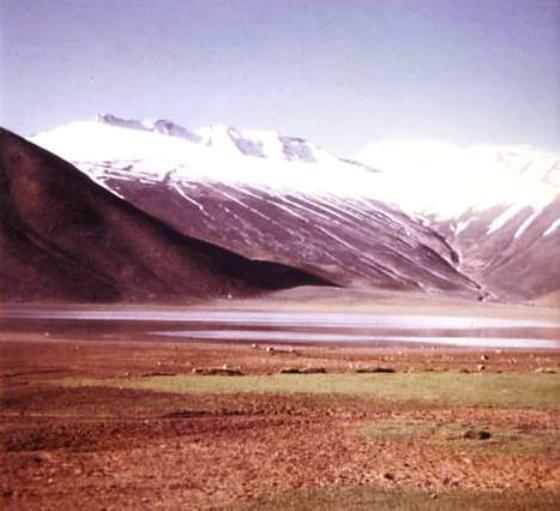 Dayet er Roumi, lake in Central Morocco; probably adapted from Amazigh agulmam n urumi, ‘lake of the christian’. 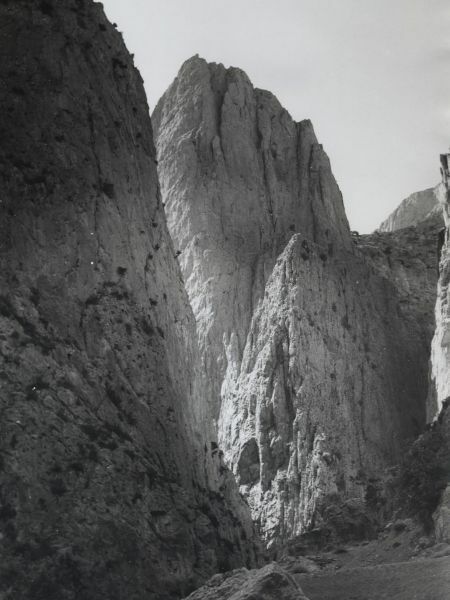 Foum Kheneg, ‘gorge entrance’, situated on upper Gigou, Midle Atlas; probably translated from Amazigh imi n waqqa. Oued el Abdi, ‘slave river’, important Oum er Rbia L-bank tributaty > asif n isexman < asif n isemġan; cf. similarly derived Amazigh tribal name of Ayt Sokhman < ayt isexman. 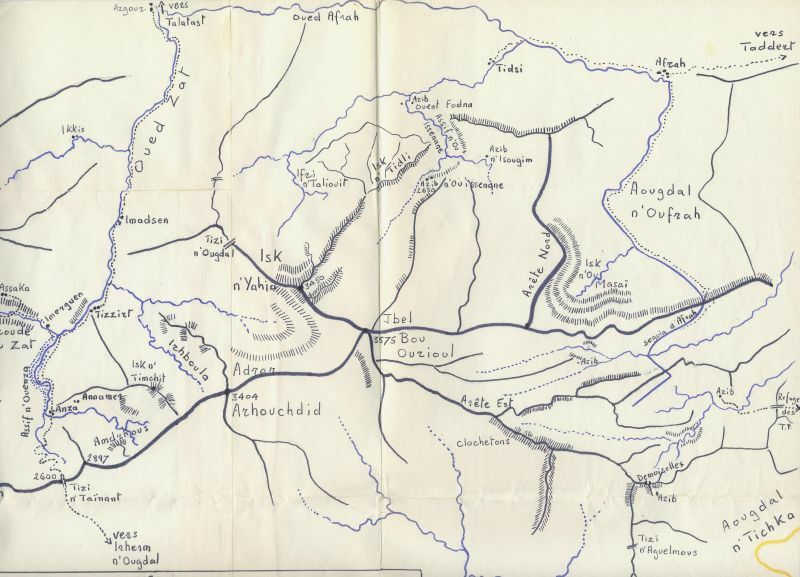 Oulad Ali, Middle Atlas village; probably translated from ayt εli. Ras el-Ma, ‘head of the waters’, spring in Middle Atlas between Ifrane and Azrou; probably translated from Amazigh ikhf aman, place-name which actually exists in Upper Ziz valley, High Atlas. Other cases of fiddling with Amazigh place-names give ludicrous results, such as: ‘Fejj Tizi n-Telghemt’; ‘source d’Aïn Aghbal’, or the equally inept ‘Jbel Adrar’. b) Other categories (French- and Portuguese-derived), etc. Al-Jadida, ‘the new one’ < Mazagan, Mazignan < Marzigao < Qaryat Wawzgan. Agadir, main city and port of Souss region, ‘castle’ < Santa Cruz/ Cruce. At least two examples of derived place-names:- abrid trantrwa between Tighessaline an Zeïda, central Morocco < Route Principale 33. battižan < Petit-Jean, French colonial name (to honour French captain killed in campaign) for former Sidi Qasm, which has since been restored. Volubilis, ruins of Roman town near Meknès < walili, ‘oleander’. 3/ ‘Hispanised’ and ‘Frenchified’ place-names Casablanca, ‘white house’, Spanish; original name Anfa, probable capital of the Barghawata. Chefchaouen, town in western part of Rif mountains < šuf iššawn, ‘see the horns’, a reference to the peaks that overlook the town. Midelt < timidelt, ‘sauce-pan cover’, name of conical, flat-topped hill five miles WNW of present town; former name, Outat n Ayt Izdeg. Oued Beth < wad baht, major Moroccan river which rises in Middle Atlas between Azrou and Mrirt. Safi < Saphie/Sophia < Asfi < asif, ‘river’; Atlantic seaport formerly colonised by Portuguese.. Tiflet, town inland from Rabat, on edge of Zemmour territory < tifel t, ‘she escaped from him’. Tetouan, town on Rif coast < tiṭṭawin, ‘the springs’. Tattiwin, village near Midelt, is similarly derived. Amusingly, probably the most frequently deformed place-name is that of Khenifra, the Zaïan ‘capital’ on the Oum er Rbia, which is pronounced Kenifra by foreign visitores, being thus confused with Kenitra and Khemisset. Kerrando < ‘Quarante-Deux’, or Km 42 on Midelt-Errachidia road; however, more likely > kkraġ aneddu, ‘let’s get up and go’, as this was often an unhealthy place for travellers to dally, similar to the spring of šrub u hrub, ‘drink, then clear out’, situated further north just below Tizi n-Telghemt. Marrakech < Merrakouch < amur a yakuš, ‘your protection we do beseech, O God’; also merrakš, which early travellers equated with ‘Maroc’ or ‘Morocco’, applying name of then capital to entire country. Mogador < Megdul (Phœnicician origin) < MacDonald, Scots castaway over whose grave a shrine was built (Sidi Megdul); actually old name of Essaouira < swira (ar. ), tassurt (ber.) and probably derived from mmu gadir, ‘she of the walls’. Tarouddant, from tarwa ddant, ‘her offspring has left her’; implying that her ihabitants have emigrated. Madrid, from ma trid, ma trit, ‘what do you want?’ Probably a form of humour! Publishing history : Unpublished. Based on presentation given at Faculty of Letters, Beni Mellal, Morocco, spring 2002. 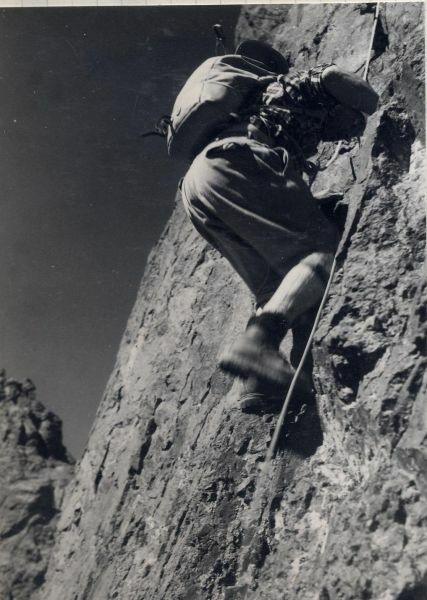 This web site contains biographical information on this researcher, of mixed Franco-Scots descente, specialized in Morocco’s Atlas mountains and Berber history and culture, together with a full list of his publications covering mountain exploration and field-work undertaken since 1964, not to mention his contribution to Berber studies and Atlas Mountain tourism through participation in various conferences and otherwise. Address: 43, rue Thiers, 38000, Grenoble, France (michael.peyron@voila.fr). Born: April 12, 1935, Cannes, Alpes Maritimes. Parents: Frédéric Aimé Peyron of Hyères (Var) and Fiona Margaret MacIver from London, UK. Married: to Josiane Yvette Maria FOLLET of Amiens (Picardy). Children: Caroline Marthe, born June 20, 1970; Margaret Fiona, born July 12, 1972. GCE exam: ‘O’ level pass in English; ‘AO’ in Latin, ‘A’ level passes in History & French, July 1952. Anglais militaire 2e degree , Meknès, 1957. Maîtrise d’Anglais, Bordeaux, July 1971. (Agrégation d’Anglais, Paris, July 1972). Doctorat 3e cycle, Géographie humaine & rurale, IGA, Grenoble, 1975. Visiting professor, King Fahd Advanced school of Translation, Tangier, 1992-2001. Member, AFEMAM, 1989-98.Organiser, Oral Literature workshop, Faculty of Letters, Rabat, 1984-88Contributor, Encyclopédie Berbère, LAPMO, Aix-en-Provence, 1985-Contributor, Littérature orale Arabo-Berbère, UPR 414/CNRS, 1988-95Contributor, Etudes & Documents Berbères, Paris, 1990-Contributor, AWAL, Cahier d’études berbères, Paris, 1995-Associate researcher, IREMAM, Aix-en-Provence, 1998-At Al-Akhawayn University in Ifrane, taught a 5-week module, « Introduction to Amazighpoetry », April-may 1999; organised « Berber study days », on May 30, 2000, April 29, 2002& on March 17-18, 2003; co-organised a « Middle-Atlas cultural week », in April 2001 & an »Arabo-Berber Poetry Night », October 17, 2002; currently in charge of Amazigh-related activities & teaching BRB 1310 – a course in Berber History & Culture + COM 3323, Writing for the media (in French). (Plateau de Bure, Dévoluy), Parpaillon & Tour du Brec de Chambeyron (Queyras), etc. 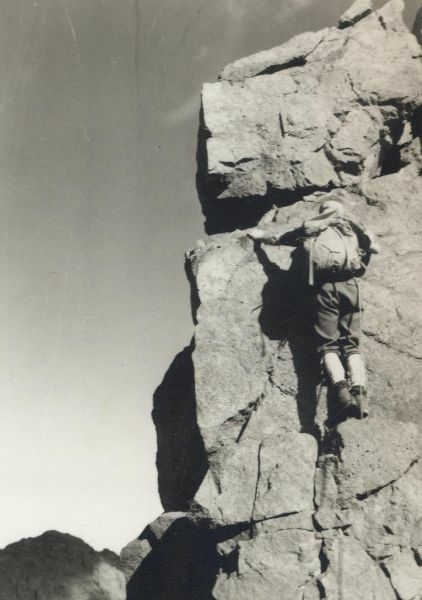 In the Moroccan Atlas :- Several PD-AD climbing routes on Angour, Ighzer Tamda (Akswal), WSW ridge of Toubkal, NE couloir Ras Wanoukrim, Wanoukrim Clochetons Traverse, Tazaghart snow couloir (all in Toubkal massif) ; Erdouz traverse, N face Jbel Ikkis, Ras Moulay Ali (Seksawa) ; Meldsen, Isk n-Yahya, Bou Wghyoul (Zat/ Ourika massif); Waougoulzat, Ighil Mgoun (Central HighAtlas). 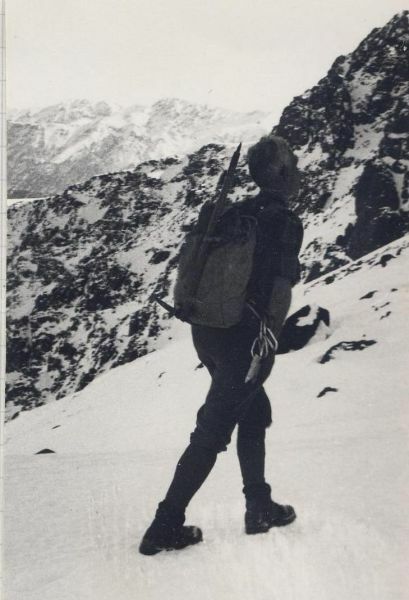 Ski outings include Lépiney/Neltner traverse, Bou Igenwan (Toubkal massif); Azurki on three occasions, Zawiya Tamga/Anergui traverse via Jbel Taytriqt, Jbel Mouriq from Tasraft (Central High Atlas); Msedrid on two occasions & Isswal (Lakes Plateau, Imilchil); Azgaw, Ma’asker and ‘Ayyachi, each on several occasions via a variety of routesEastern High Atlas); Hayyan, Tichchoukt, Bou Iblan, last-named half a dozen times via different routes (Middle Atlas).Has been successively, President, French Alpine Club (C.A.F. 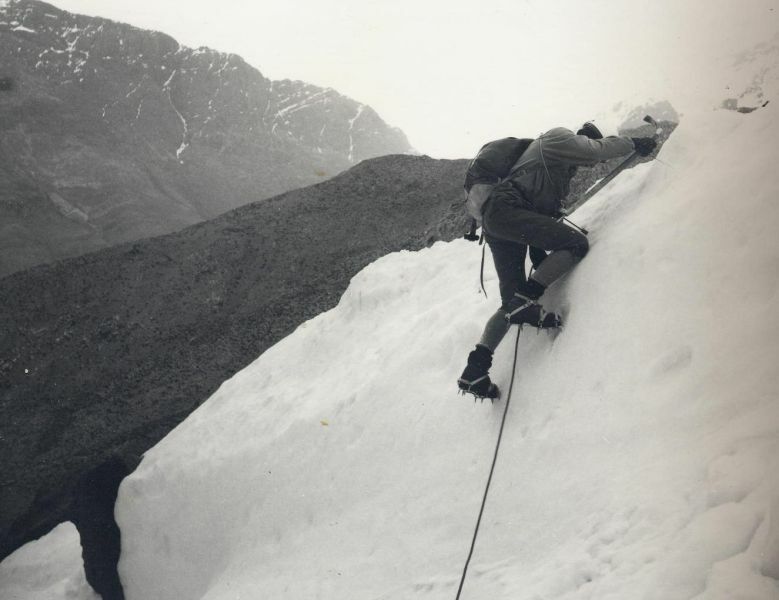 ), Rabat, 1975-85; also member, Alpine Club of London, 1994- & member, « Les Amis du Refuge du Toubkal », 2000- Also other outings too numerous and varied to be recorded here. “L’évolution des rapports villes-campagnes”, Faculty of Letters, Rabat, 13-15 December, 1984. Colloque du Grand Meknès, Faculty of Letters, Meknes, October, 1985. “Trente années de recherché universitaire au Maroc”, Faculty of Letters, Rabat, October & December 1986. 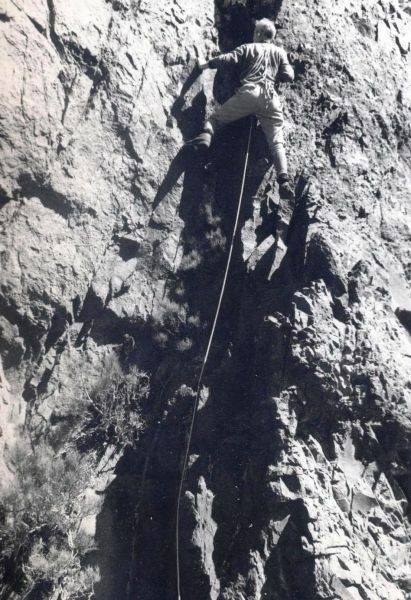 Union of International Alpine Associations (UIAA), Marrakech, October 1987. AFEMAM Conference, Baume-lès-Aix, 26-28 June 1989. AFEMAM Conference, INALCO, Paris, July 1990. AFEMAM Conference, Urbama, Tours, July 1991.AFEMAM Conference, Toulouse-Le Mirail University, July 1992.EURAMES Conference, University of Warwick, UK, 8-11 July, 1993.« Fête de la Transhumance », Die, 17-26 June, 1994. AFEMAM Conference, Strasbourg, 30 June-3 July, 1994. « Peuples Berbères », 17th Douarnenez Film Festival, 21-28 August, 1994. « Table-ronde sur les etudes berbères », Faculty of Letters, Meknes, December 1994. « Fête de la Transhumance », Die, 17-25 June, 1995. Tafsut Imazighen, 25 March-6 April, 1996, Grenoble. AFEMAM Conference, Aix-en-Provence, July 1997. Tafsut Imazighen, 22 March-5 April, 1997, Grenoble. Conference on sustainable development, Faculty of Letters, Marrakech, October 1997. AFEMAM Conference, Université Lumière-Lyon II, 2-4 July, 1998. « Estivales du Trièves », Monestier-du-Percy, 25 July, 1998. « Sustainable development in Sefrou province », Sefrou, September, 1998. « Berber Culture Festival », Rasa, Utrecht, Netherlands, 5-8 November, 1998. « Les couleurs de l’échange: du Maroc à l’Orient », Toulouse, July 1999.Sefrou colloqium (to honour Clifford Geertz), 4-6 May 2000. « Fête de la Transhumance », Die, June 2000. CERMOSEM Conference, Pradel, Ardèche, 18-20 September, 2000. « Political Discourse, theories of Colonialism & Post-Colonialism », British Council (Churchill Club), Casablanca, 12-14 April 2001.Sustainable Tourism workshop, British Days in Morocco, AUI (Ifrane), 5-6 March, 2002.First World Congress for Middle Eastern Studies, University of Mainz, Germany, September 8-13, 2002.“Les manuscrits berbères au Maghreb et dans les collections européennes”, Manumed/IREMAM, Aix-en-Provence, 9-10 December, 2002. 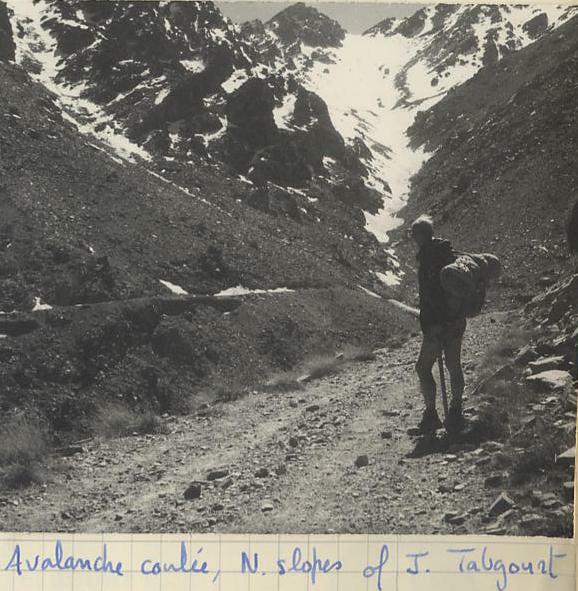 « Great Atlas Traverse », slide-lecture, American School, Rabat, April 1976. 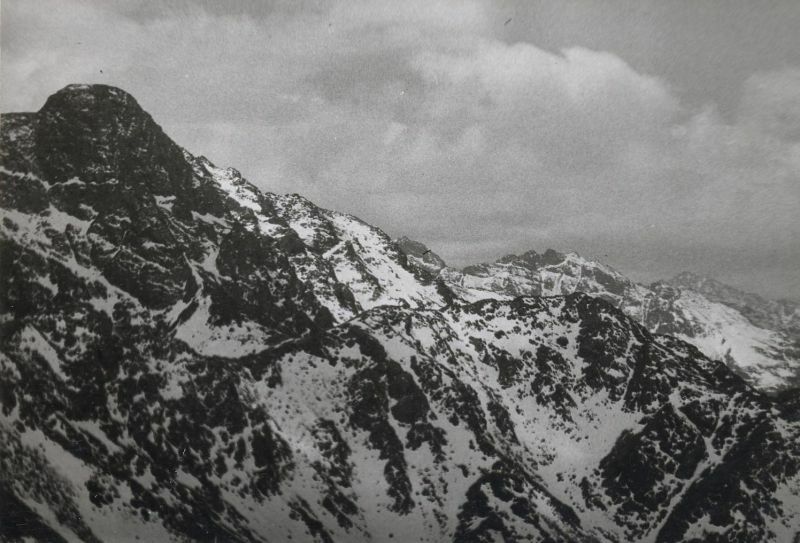 « Les Berbères du Haut Atlas marocain », Musée Dauphinois, Grenoble, March 1989. « La poésie berbère du Moyen-Atlas », Baume-lès-Aix, June 26, 1989. Colloque de Sefrou, Sefrou, April 9-11, 1992. « Poésies pastorales des transhumants du Moyen-Atlas marocain », Die, June 24, 1994.« De la Berbérie au 7e ciel : un poème épique marocain », Valcroissant Abbey, Die, June 23, 1995.« Proverbs of the Moroccan Atlas », Faculty of Letters, Meknes, March 1, 1996. Hmad (Hammou) ou Namir », AUI, March 4,1996.« Middle Atlas poetry : past and present », Faculty of Letters, Meknes, February 28, 1997. « Analyse du poème Hammou Namir (tachelhiyt) » (AFEMAM, Atelier n° 65), Aix-en-Provence, July 1997.« The Moroccan mountaineer’s environmental perception », lecture given at Faculty of Letters in Marakech (August 29, 1997) & Faculty of Letters, Rabat (September 2, 1997) + at AUI, October 17, 1997. “Orality & literacy, introduction”, AUI, HUM 5358 class, January 1998.“Communicative strategies in oral literature: Gaelic-inspired language & devices”, AUI, HUM 5358 class, January 1998. “The marks of orality in the Goddodin”, AUI, HUM 5358 class, February 1998. “Markers in oral tales: taŠelhit & warayni dialect”, AUI, HUM 5358 class, March 1998. (+ lectures on Finn MacCumhail, “Cattle raid of Cooley” & the tale of Deirdre, “Kulwch & Olwen”, “Beowulf”, Icelandic sagas, the Gilgamesh legend, etc., AUI, HUM 5358, spring 1998).« An introduction to Berber culture » for visiting students & faculty from University of Austin, Texas (UTA), AUI, end-May 1998. (A presentation repeated for the benefit of other UTA visitors in 1999, 2001 & 2002).« Moyen-Atlas & Haut Atlas oriental : une région uniforme », Sefrou, September 7,1998. 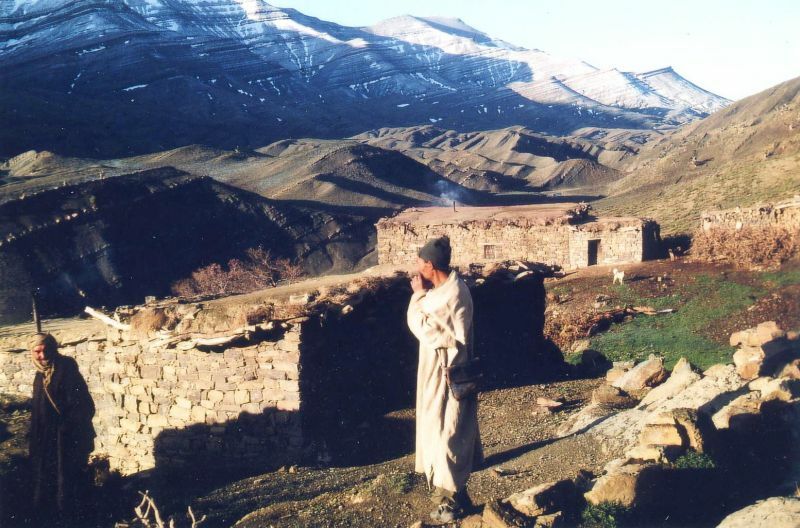 « Culture shock & mountain tourism in the Moroccan Atlas », Capstone students, AUI, April 27, 1999.« Habitat rural & citadin au Maroc », Temps du Maroc, Grenoble, October 13, 1999. « Le Haut Atlas marocain », Fontaine en Montagne Cultural Festival, Fontaine, October 22, 1999 ;slide-lecture later repeated elsewhere in Grenoble area at « Autres Horizons », Seysssins, November 9, & at « Centre des Arts », Meylan, December 20, 1999.“Moroccan High Atlas”, slide-lecture, Trinity College, Oxford, UK, December 3, 1999. « Histoire & culture berbère », Musée Dauphinois, December 16, 1999.« The Ayt Yahya of Tounfit (Central Morocco) », Capstone students, AUI, February 3, 2000. « Amdyaz, the wandering bard of Berber culture « , AUI, April 3, 2000.“Self-taught Tamazight for a non-Moroccan”, AUI, May 30, 2000.“Poésies religieuses berbères”, Die, June 2000. « Poésie et religion chez les Berbères marocains », for Gilles Keppel and Sciences-Po (Paris) students, AUI, February 6, 2001.“Amazigh Poets of the Middle Atlas”, Churchill Club, Casablanca, April 2001. “From Jbal Fazaz to Middle Atlas; from boondocks to boom towns”, AUI, November 2001.« Rural tourism in the Moroccan Atlas », AUI, March 6, 2002. « Langue et culture amazighe : la problématique actuelle », Faculty of Letters, Beni Mellal, March 11, 2002.« Lectures de poesies amazighes », ENS Takkadoum, Rabat, March 26, 2002.« Contributions by a Franco-Scots student of Tamazight », AUI, April 29, 2002.« Berbers of the Moroccan Atlas », CNAC presentation, AUI, June 5, 2002. « Le classement des archives du fonds Roux « , IREMAM, Aix-en-Provence, December 9, 2002. « From Tazigzaout battle to Green March », AUI, « Amazigh Days », March 18, 2003.« Poésie amazighe dans le Moyen Atlas », CCF de Fès (April 25, 2003) & CCF de Meknès (April 26, 2003). 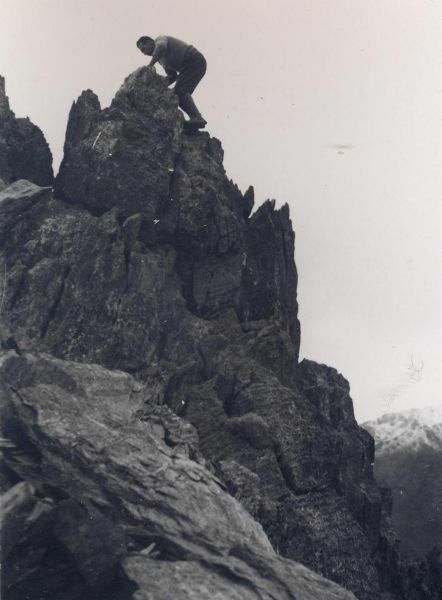 Tounfit et le pays Aït Yahia, Doctoral dissertation in geography, IGA, Grenoble, September 1975. 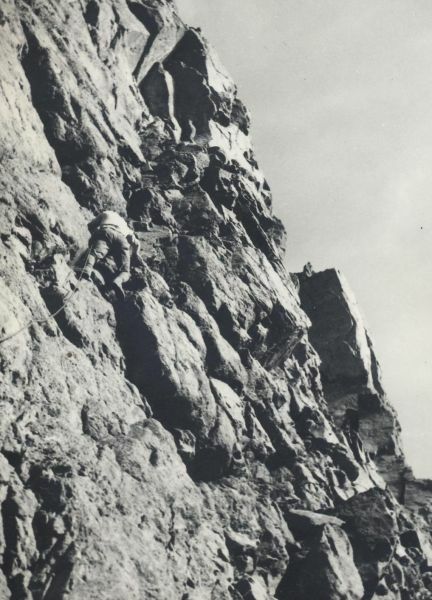 De l’Ayachi au Koucer: randonnées dans le Haut Atlas, French Alpine Club, Rabat, 1977. La Grande Traversée de l’Atlas marocain (G.T.A.M. ), Rabat: Imprimatlas, 1988 (1984). 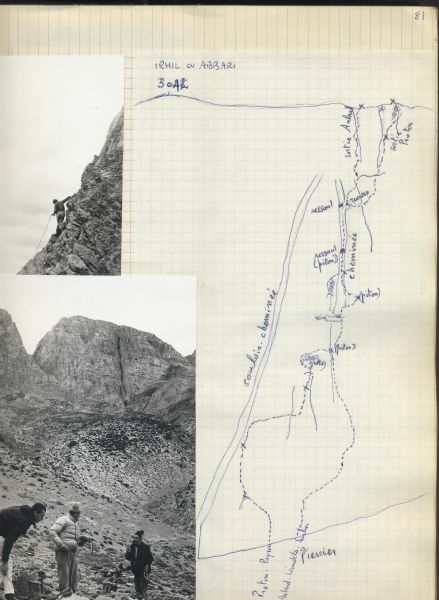 Great Atlas Traverse Morocco, vol.1 Moussa gorges to Ayt Bou Wgemmaz, Goring: West Col, 1989. 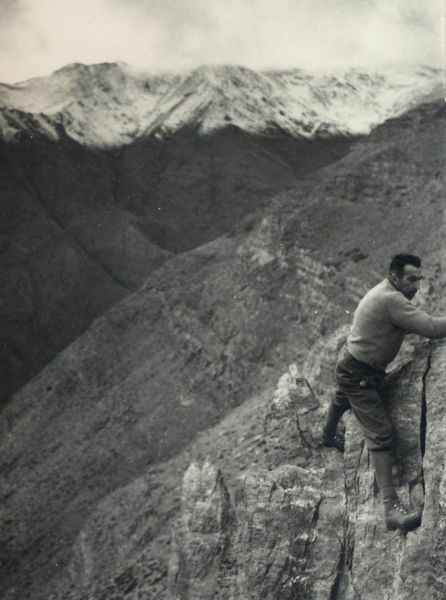 Great Atlas Traverse Morocco, vol. 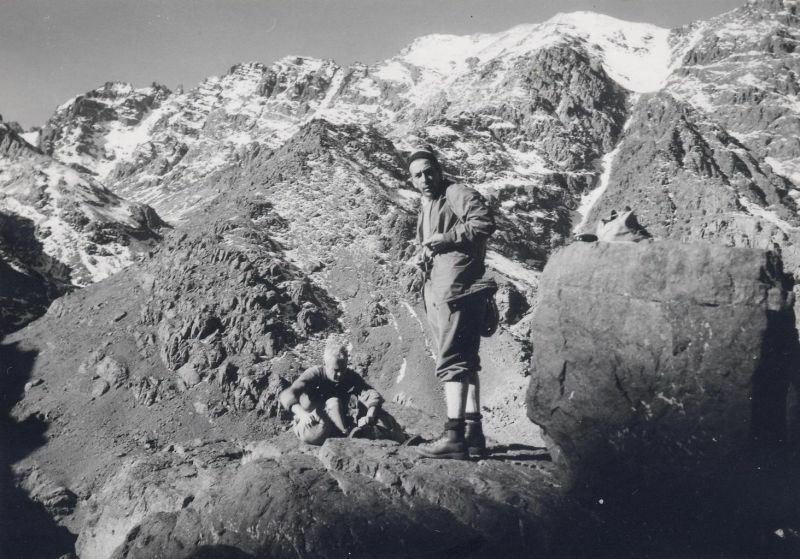 2 Ayt Bu Wgemmaz to Midelt including Middle Atlas and Saghro massif, Goring: West Col,1990. Isaffen Ghbanin/ Rivières Profondes, poésies du Moyen-Atlas Marocain traduites et annotées, Casablanca: Wallada, 1993. 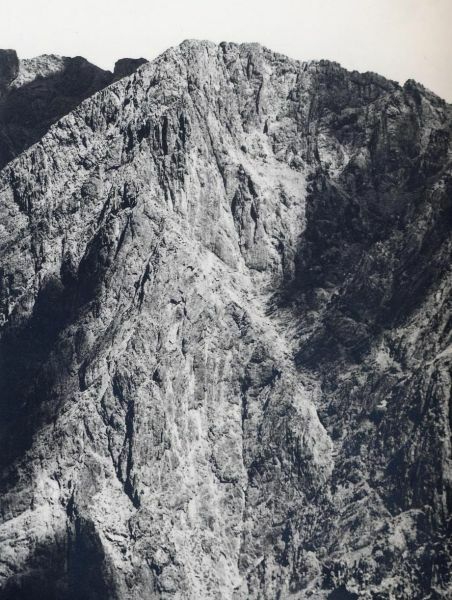 Vercors-Dévoluy: mountains and landscapes, Goring: West Col, 1994. Provence: mountains and landscapes, Goring: West Col, 1998.Annotated Berber Bibliography, AUI, 2000. Poésies berbères de l’époque héroïque, Maroc central (1908-1932), Aix-en-Provence: Edisud, 2002. Guide de trekking, Maroc, coffret Nathan, 2002. As co-author with H. Stroomer & C. Brenier-Estrine, Catalogue des archives berbères du fonds “Arsène Roux”, Köppe-Vogel RKVK, 2003. Women braver than men: Berber heroines of the Moroccan Middle Atlas, AUI, 2003. 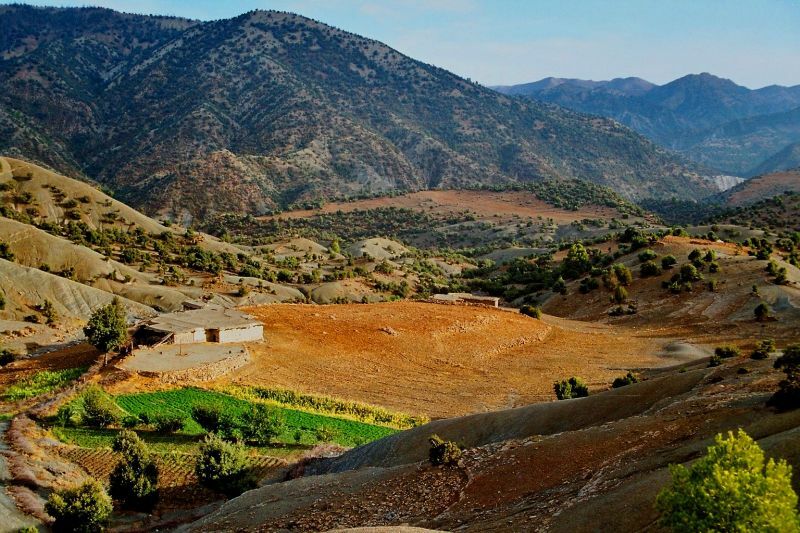 Hills of Defiance, a detailed history of the Berbers of the Moroccan Atlas (in preparation). zi ti n dzizawt ar tawada tazizawt, Middle-Atlas Berber poetry 1932-1975 (in preparation). 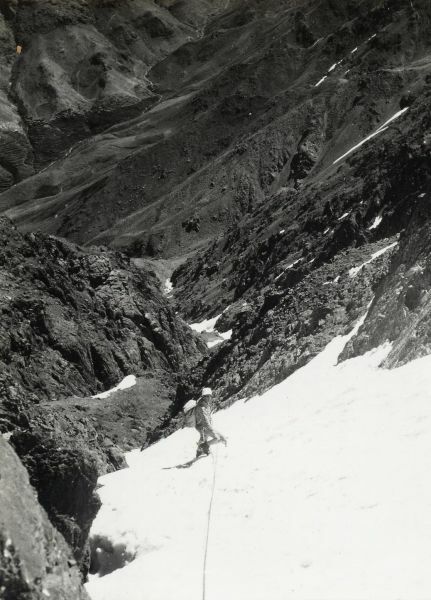 « Les massifs peu connus du Maroc », La montagne & alpinisme, April 1970: 262-268.« Le ski de haute montagne au Maroc », La montagne & alpinisme, February 1971: 19-28. 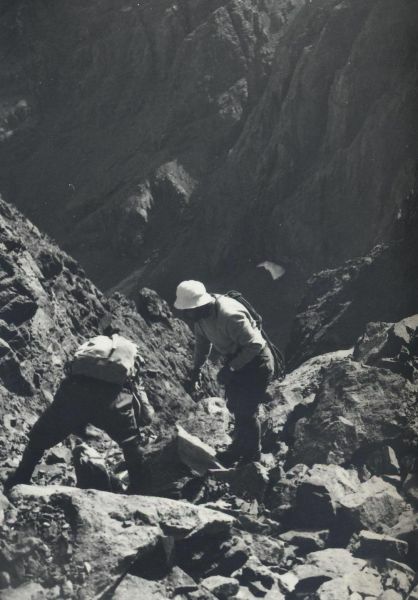 « Autour du Jebel Masker », La montagne & alpinisme, 2/1973: 61-66. 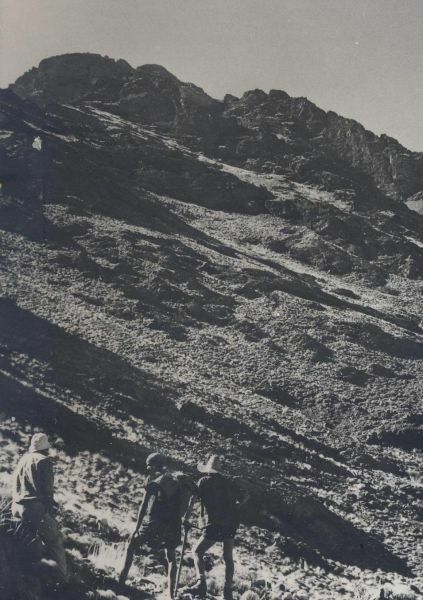 « Habitat rural dans le Haut Atlas de Midelt », revue de géographie alpine, 2/1976: 327-363.« La grande traversée de l’Atlas marocain », La montagne & alpinisme, 1/1977: 18-29.« Les chutes de neige dans l’Atlas marocain », revue de géographie alpine, 3/1980 : 237-254. 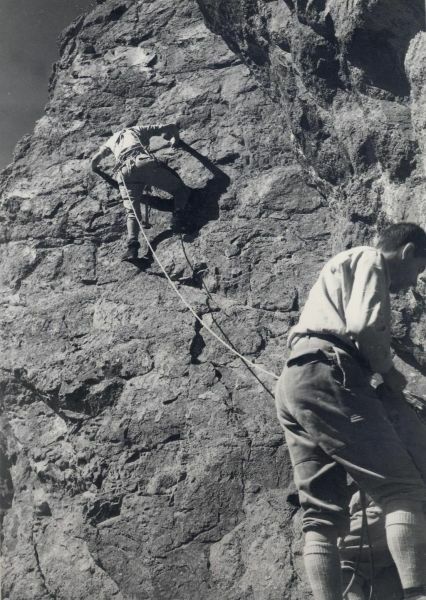 « A pas feutrés dans le Haut Atlas », La montagne & alpinisme, 1/1981: 78-85. « Contribution à l’histoire du Haut Atlas oriental: les Ayt Yafelman », R.O.M.M., 38/1984-2: 117-135. « Une forme dynamique de poésie orale: les izlan & timawayin du Moyen-Atlas (Maroc) », Langues & Littératures, Fac. des Lettres, Rabat, IV/1985: 161-185. 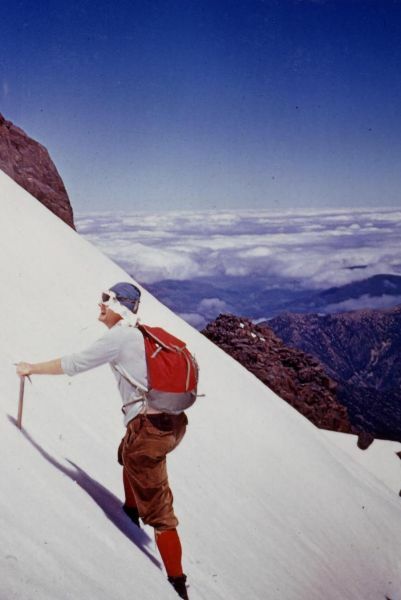 « D’Aghbala à Bab Bou Idir: la traversée du Moyen Atlas », La montagne & alpinisme, 4/1985: 38-41. « Continuité et changement dans une zone de transition au Maroc: la Haute-Moulouya et le Haut Atlas de Midelt », Les régions de piémont au Maghreb: ressources & aménagement, Tours: Les cahiers d’URBAMA, 18/1994: 71-79. 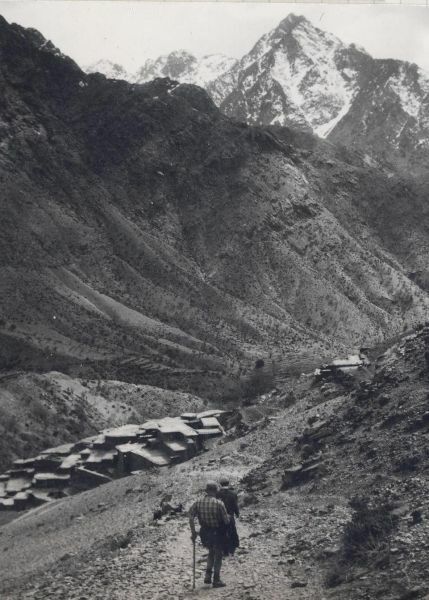 « Tradition orale et résistance armée: la bataille des Ayt Yâqoub (Haut-Atlas, 1929) », E.D.B., 12/1994: 5-16. « Notes concernant l’agencement des timawayin (strophes) du Moyen-Atlas marocain », L.O.A.B., 1995/22-23: 53-60. 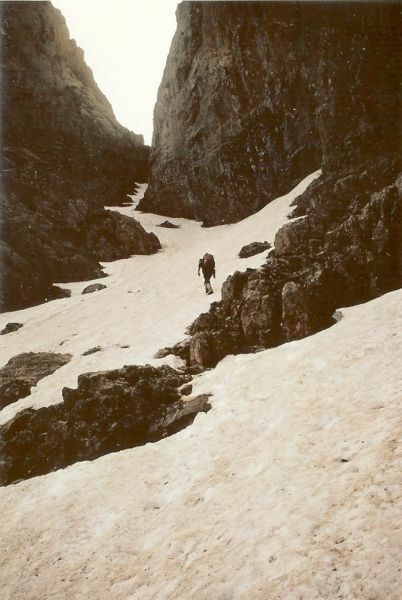 « Middle Atlas Berber poetry », The Alpine Journal, London, vol.10/n°344, 1995: 96-99. 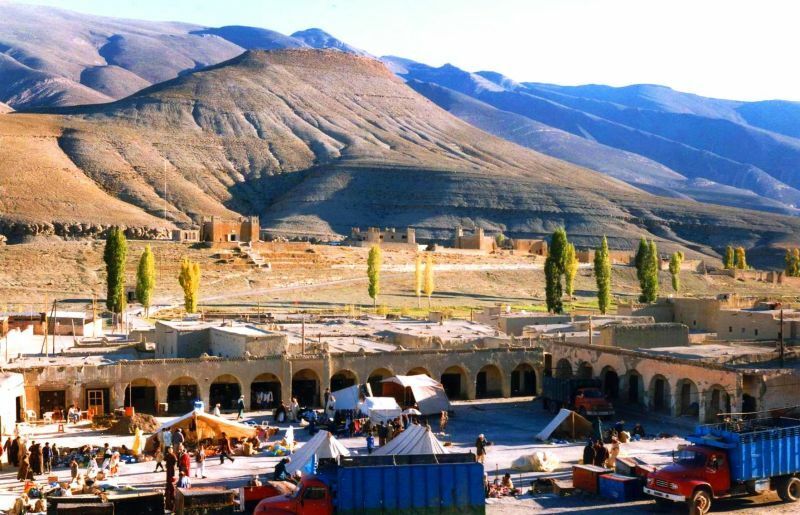 « En marge de la GTAM : réflexions sur certains aspects du tourisme sportif dans l’Atlas marocain », Actes du colloque international : Quel avenir pour le tourisme en montagne au Maroc, Marrakech, 18-21 November 1995, Royal Air Maroc :107-114. « La poésie tamazight du Moyen-Atlas marocain. Discours identitaire ou identité affirmée », Sociétés et cultures musulmanes d’hier et d’aujourd’hui, Paris: AFEMAM, 1996: 29-32. « Les bardes berbères face à la pénétration militaire française: Maroc central (1914-1933), AWAL, 14/1996: 47-73. « L’école Roi Fahd de traduction », Tanger au miroir d’elle-même, Toulouse: Horizons maghrébins, 31/32, printemps 1996: 218-221. « Ernest Gellner and the studies on Berber societies », L’Astrolabe: le semestre de l’AFEMAM, Aix-en-Provence, 1996: 60-62. « La saga des Aït Bou Slama », E.D.B., n°14/1996: 75-95. « La mujer tamazight del Marruecos central », El Vigia de Tierra, Melilla, 1996/97 : 139-151. 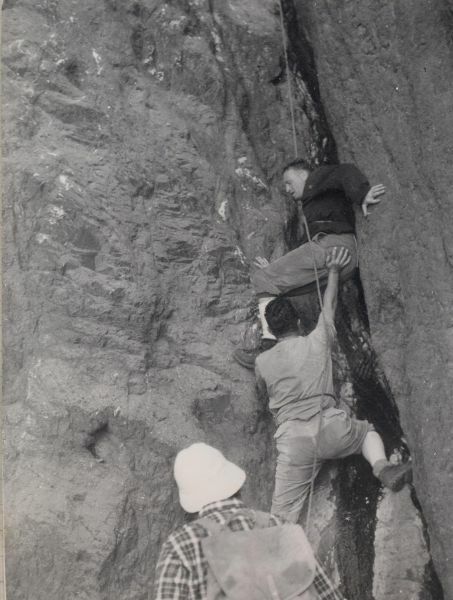 « Further research on ‘timawayin’ from Central Morocco », J.N.A.S., n°1 (Summer 1997) pp.72-80. « Combattants du Maroc central: une résistance morcelée (1912-33) », AWAL, 16/1997: 25-41. 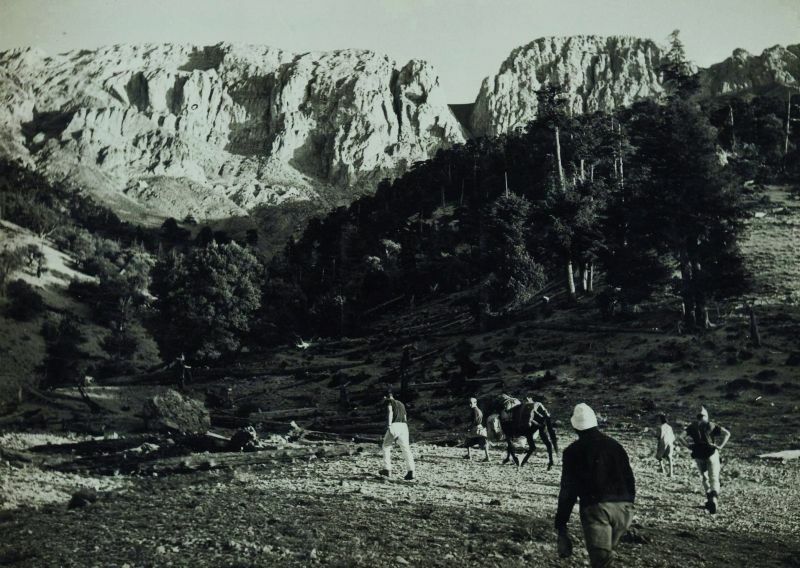 « Les montagnards de l’Atlas marocain et leur perception du milieu naturel », Montagnes Méditerranéennes, 7/1998: 139-142. « Entre haine & amour: officiers des A.I. et tribus dissidentes (Atlas marocain, 1914-56) », in AWAL, 19/1999: 9-18. « Le mariage chez les Ayt Yafelman du Haut Atlas marocain », E.D.B., n°17/1999: 165-173.« Poésies de résistance (Maroc central, 1908-1933) », in La Revue des Deux Rives, n°2/2001 : 139-154.« Les inadéquations entre savoir & développement: le cas du Moyen-Atlas marocain », Montagnes Méditeranéennes, 12/2000: 49-52.« Les couleurs dans l’oralité des Imazighen du Maroc central », Horizons Maghrébins, Toulouse, 42/2000 : 118-124.« Amazigh poetry of the resistance period (Central Morocco), J.N.A.S., n°1(Spring 2000) pp.109-120. « Qala’at al-Mahdi: place-forte des hérétiques Barghawata dans le Moyen-Atlas marocain (XIe siècle) », AWAL, 25/2002: 105-110.« Qala’at al-Mahdi : a pre-Almoravid fortress in the Moroccan Middle-Atlas », J.N.A.S., Summer 2003. « French actions in the Algerian revolution were necessary as part of a wider crusade against Communism « ,(16a) History in Dispute series, (David Lesch ed., in the press). “Classifying North Africa as primarily Arab tends to ignore the cultural, social and political influence of the Berbers”, (67b) History in Dispute series (David Lesch ed., in the press). D. M. Hart, Dadda ‘Atta & his forty grandsons, in R.O.M.M., 1982-2: 149-150. M. Taifi, Dictionnaire tamazight-français & E. Laoust, Noces berbères (C. Lefébure, éd. ), in Prologues, n°3/1994 : 52-54. J. Borgé & N. Viasnoff, Archives du Maroc + M. Williams & G. Watterson, An anthology of Moroccan short stories, in Annuaire de l’Afrique du Nord, XXXIV, 1995: 1013,1140. A. Bounfour, Le noeud de la langue, Edisud: Aix-en-Provence, 1994, in AWAL, 14/1996: 147-150. D.M. Hart, Emilio Blanco Izaga, Coronel en el Rif, Melilla, 1995, in AWAL, 14/1996: 150-163. « Graphie berbère: Pour qui? Pour quoi faire? », in AWAL, 14/1996: 156. U.K. Hart, Behind the Courtyard Door, & M. Williams & G. Waterson, An Anthology of Moroccan Short Stories, in J.N.A.S., vol.1, n°3, Winter 1996: 312-313. J. Podeur, Textes berbères des Aït Souab: Anti-Atlas, Maroc, (N. Van Boogert & H. Stroomer eds. ), in AWAL, 15/1997: 108-110. H. Jouad, Le calcul de l’inconscient de l’improvisation: poésie berbère, rythme, nombre et sens, Paris & Louvain, Peeters, 1995 in AWAL, 15/1997: 110-112. 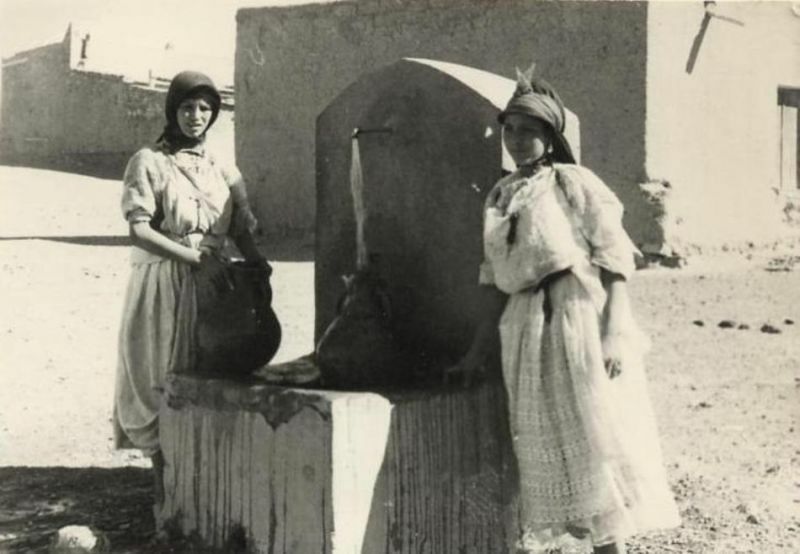 M. Courtney-Clarke & G. Brooks, Imazighen: the vanishing traditions of Berber women, in Morocco: the Journal of the Society for Moroccan studies, London, n°2/1997: 92-93. M.R. Olsen, Chants & danses de l’Atlas (Maroc), in AWAL, 17/1998 : 140-142. D.M. Hart, Estructuras tribales precoloniales en Marruecos bereber, 1860-1933 : une reconstruccion etnografica en perspectiva historica ; M. Quitout, Grammaire berbère (rifain, tamazight, chleuh, kabyle) ; N. Van den Boogert, « La révélation des énigmes ». Lexiques arabo-berbères des XVIIe & XVIIIe siècles ; AWAL, 19/1999 : 151-157. M. Gershovich, French Military Rule in Morocco : Colonialism & its consequences, London: Frank Cass, 2000, in AWAL, 24/2001: 122-123. D.M. 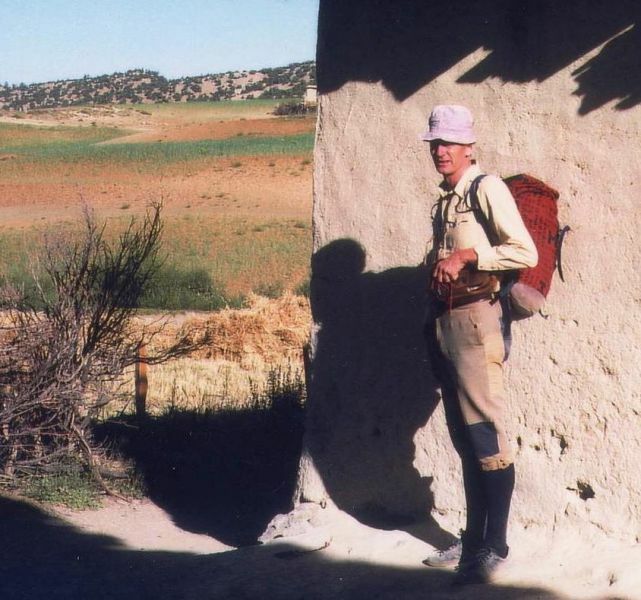 Hart, Tribe & Society in Rural Morocco, London: Frank Cass, 2000, in AWAL , 24/2001: 124-125. P. Galand-Pernet, Littérature berbère : des voix et des lettres, Paris: P.U.F., 1998, + M.P. Rauzier ; C. Tréal, J-M. Ruiz, Tableaux du Haut Atlas marocain, Paris: Arthaud, 1998, in La Revue des Deux Rives, n°2/2001: 169-172 & 173-176. D. Rivet, Le Maroc de Lyautey à Mohammed V: le double visage du Protectorat, Paris: Denöel, 1999, in AWAL, 25/2002: 122-129. A335. ‘Ayyachi, Jbel (Aari n-ou ‘Ayyach), VIII/1990: 1200-1204. B55. Belgassem Ngadi, IX/1991: 1434-1435. B56. Ben Barakat, ‘Ali (Ou-Barka ‘Ali), IX/1991: 1435-1436. B96. Bou Zert (Bni, Ayt Warayn – aperçu linguistique), X/1991: 1579-1584. C42. Chants – Chants berbères du Maroc, XII/1993: 1862-1869. D10. Danse – domaine berbère marocain, XIV/1994: 2204-2213. D39. Devinettes du domaine berbère marocain, XV/1995: 2287-2289. D93. Dromadaire (domaine montagnard marocain), XVII/1996: 2547-2550. F4. Fantasia, XVIII/1997: 2721-2727.F10. Fazaz (Jbel), XVIII: 2745-2747. G56. Glaoui/Glaoua, XXI/1999: 3151-3160 ; + Greniers de falaise, XXI/1999: 3219-3220.H6. Hadiddou (Ayt), XXI/1999: 3278-3283.H42. Hérisson – dans la littérature orale du Maroc, XXII/2000: 3448-3451.H48. Hibou (Atlas marocain), XXII/2000: 3458-3459. I 15. Ichqern, XXIII/2000: 3612-3617. I 48. Imhiwach, XXIV/2001: 3694-3703. This updates that part of the present CV that appears above on my website (which was valid up to and including early 2003), and includes some late-published material. H. Stroomer & M. Peyron, Catalogue des Archives berbères du « Fonds Arsène Roux », Köln, Rüdiger Köppe Verlag, 2003. Amazigh Days at Al Akhawayn University : paving the way for Tifinagh, (Michael Peyron ed. ), Ifrane AUI Press, 2004. The Amazigh Studies Reader, (Michael Peyron, ed. ), Ifrane, AUI Press, 2006. Journée amazighe à l’Université Al-Akhawayn, Colloque : « Sites de mémoire et tradition orale amazighe », M. Peyron (éd. ), Ifrane, AUI Press, 2007. Tassawt Voices, M. n-Ayt Attiq & R. Euloge, (M. Peyron, trans. ), Ifrane, AUI Press, 2008. Birds at Al Akhawayn, Ifrane : Al Akhawayn University Press, 2010. 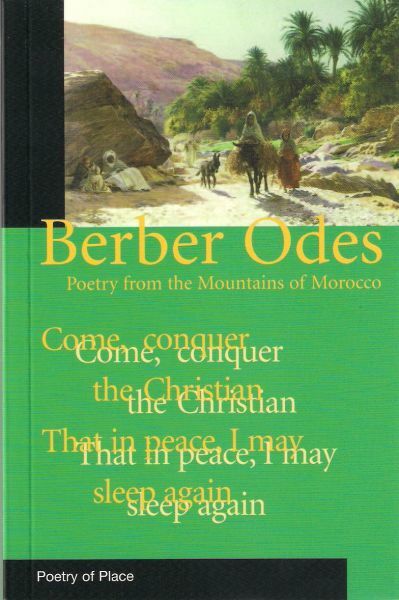 Berber Odes: Poetry from the Mountains of Morocco, London, Eland Books, 2010. “Le mariage chez les Ayt Yafelman de l’Atlas marocain”, E.D.B., n°17/1999 : 153-174. “Amdyaz, the wandering bard of Berber poetry”, E.D.B., n°18/2000: 104-110. “Izli”, Encyclopédie Berbère, (S. Chaker éd. ), Aix-en-P., Édisud, XXV, 2003 : 3828-3832. “From Tazizgzaout battle to Green March”, Amazigh Days at AUI, Ifrane, AUI Press, 2004: 103-112. “Langue poétique littéraire : enjeux et mutations chez les poètes du Maroc central”, La littérature amazighe : oralité et écriture, spécificités et perspectives, Rabat, I.R.C.A.M., 2004 : 191-199. 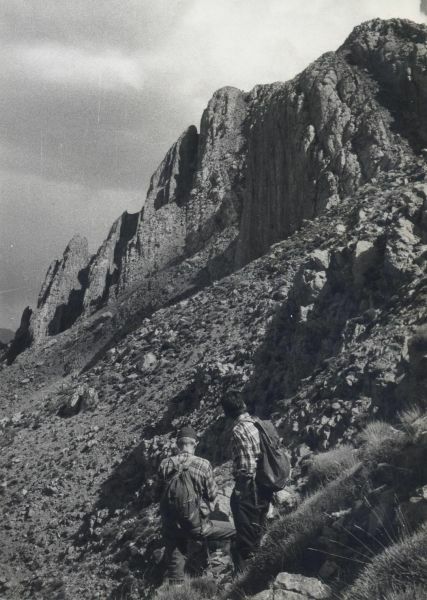 “L’éco-tourisme comme levier de développement des ressources territoriales: le cas des massifs orientaux de l’Atlas marocain”, Montagnes Méditerranéennes, 2004, n°20 : 187-194. “Bringing Berber literature out of the academic wilderness”, Expressions maghrébines, Universistat de Barcelona & Florida State University, (Marta Segarra, ed. ), Vol.4, n°1, summer 2005: 15-33. “Khénifra”, Encylcopédie Berbère, (S. Chaker éd. ), Aix-en-P., Édisud, XXVII, 2005 : 4236-4239. “Le paysage imaginaire de la poésie amazighe du Moyen-Atlas”, Linguistique amazighe : les nouveaux horizons, (A. Allati, éd. ), Tétouan, Fac. des Lettres, 2006 : 224-236. “Barghawata et résistance”, La résistance marocaine à travers l’histoire, ou le Maroc des résistances, Rabat, I.R.C.A.M., 2005 : 165-181. “Oralité et résistance: dits poétiques et non poétiques ayant pour thème le siège du Tazizaout (Haut Atlas marocain, 1932)”, E.D.B., n°25-26/2007 : 307-316. 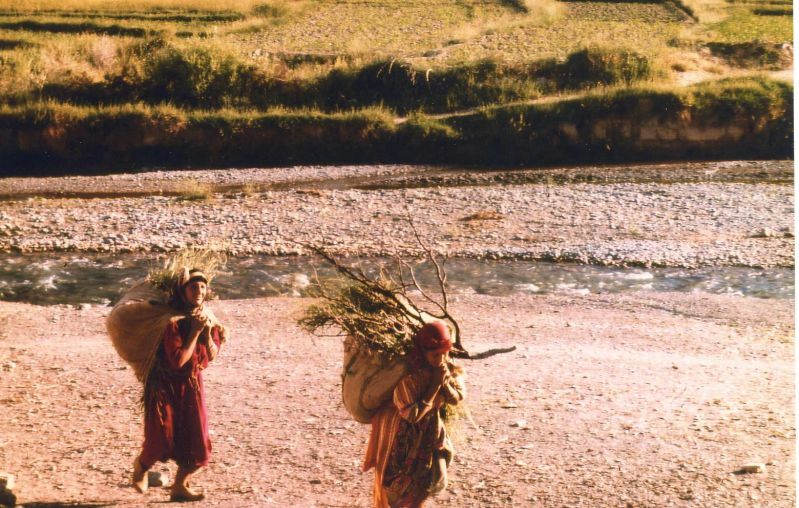 “Women and water management and water-related issues in the Atlas mountains”, Proceedings of the International Workshop on Women in Water management, Ifrane, AUI, 2007. “From Jbel Fazaz to Middle Atlas: from boondocks to boom towns; the past as key to the present”, North African Mosaic: a cultural reappraisal of ethnic and religious minorities, (N. Boudraa & J. Krause, eds. ), Newcastle, Cambridge Scholars Publishing, 2007: 258-268. “Kousser”, Encyclopédie Berbère (S. Chaker éd. ), XXVIII (2008). « Tazizaout : une bataille oubliée », La bataille de Tazizaout – 1932 – entre écrits et oralité, OCADD, Cahier n°1/2008 : 3-8. « Emprunts, manipulations et confusion des genres izli, tamawayt, tayffart, et tamdyazt dans la poésie tamazighte épique : le cas de Tazizaout », Les types poétiques amazighes traditionnels, Rabat : IRCAM, 2009 : 75-86. « Hostilités académiques: approches conflictuelles à propos de Imazighen du Maroc central », IRCAM conference proceedings, Fès, May 2009 (in the press). « Recent cases of incomplete academic research on Morocco’s Berbers », JNAS, vol. 15, issue 2, June 2010: 157-171. 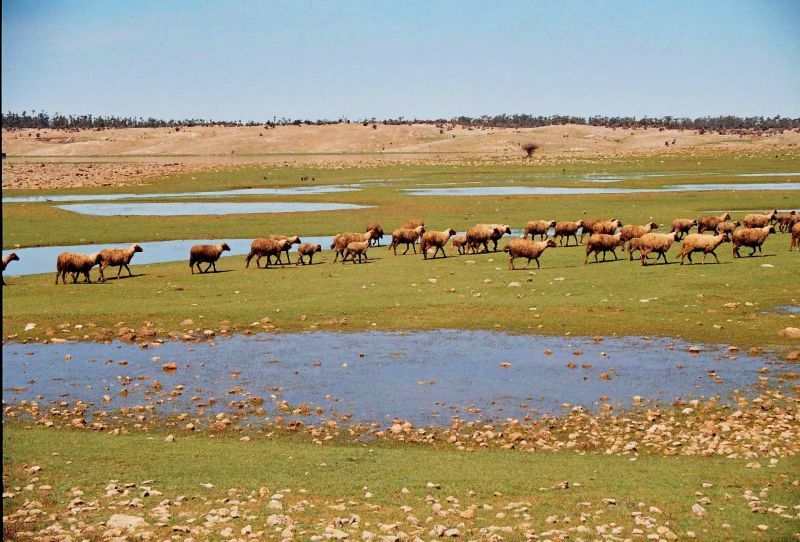 «Wild life conservation in Morocco’s Eastern Atlas ranges », Maroc: tourisme et développement local,(M. G. Luica & H. Ramou, éds. ), Paris & Torino : L’Harmattan, 2010 : 270-286. Chantal de la Véronne, Yaghmurasen. Premier souverain de la dynastie berbère des Abd-el-Wadides de Tlemcen, Saint-Denis, Bouchène, 2002.Abdelaziz Allati, Diachronie tamazighte ou berbère, Tétouan, Université Abdelmalek Essaâdi, 2002. 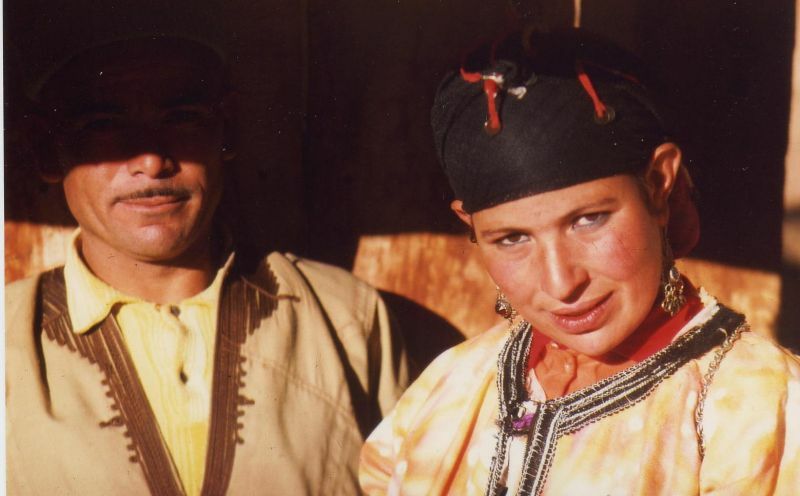 Fatima Sadiqi and Moha Ennaji, A Grammar of Amazigh, Fès, Dhar El Mehraz, 2004, in AWAL, Cahier d’Études berbères, n°31/2005: 139-148. Salima Naji, Greniers collectives de l’Atlas: patrimoines du Sud marocain, Casablanca, La Croisée des Chemins/Édisud, 2006, in AWAL, Cahier d’Études berbères (sous presse). “Issues which Middle Atlas women have to face”, Dr. J. Shoup’s social anthropology class, AUI, April 19, 2006. “Les femmes du Moyen-Atlas”, Atlas Tiwtmin’s Day, AUI, 05/03/2007. “Poésie amazighe”, Atlas Tiwtmin’s Day, AUI, 05/03/2008. »Amazigh history and culture », AUI, for students visiting from Harvard University (USA), 22/03/2010. Colloque sur la poésie amazighe, I.R.C.A.M., Rabat, 23-25 octobre 2003. Colloque sur la résistance amazighe, I.R.C.A.M., Rabat, novembre 2003. Colloque « la notion de ressource territoriale », CERMOSEM, Le Pradel, 14-15 octobre 2004. Linguistique amazighe : les nouveaux horizons, colloque à la Faculté des Lettres de Tétouan, 17-19 février 2005. “Le rôle politico-social des imdyazn du Haut Atlas oriental”, Atelier sur le Patrimoine National Oral, sous la direction de Mostafa El-Chadli, Marrakech, 25 février, 2005. “Amazigh Day” conference, Ifrane AUI, April 2006. Mountain tourism workshop, Al-Akhawayn University, Ifrane, April 17, 2007. “Les almu-s et agdal-s de l’Atlas oriental: état des lieux”, Conférence International, mai 2007, Marrakech. Instructor at Berber Summer Institute, Corwallis, Oregon State University, USA, June 24-July 10, 2007. “Choreography in MiddleAtlas aḥidus dancing”, Amazigh Day 2008, Ifrane, AUI, April 2008. Two lectures on Amazigh culture, at Middle East Studies centre, St. Anthony’s, Oxford, UK, Oct. 2008. Symposium Sport/Nature : »Colloqe sur les pratiques innovantes dans le tourisme », CERMOSEM, Le Pradel, Ardèche, Nov. 2008. Amazigh Day , AUI, March 25, 2009. 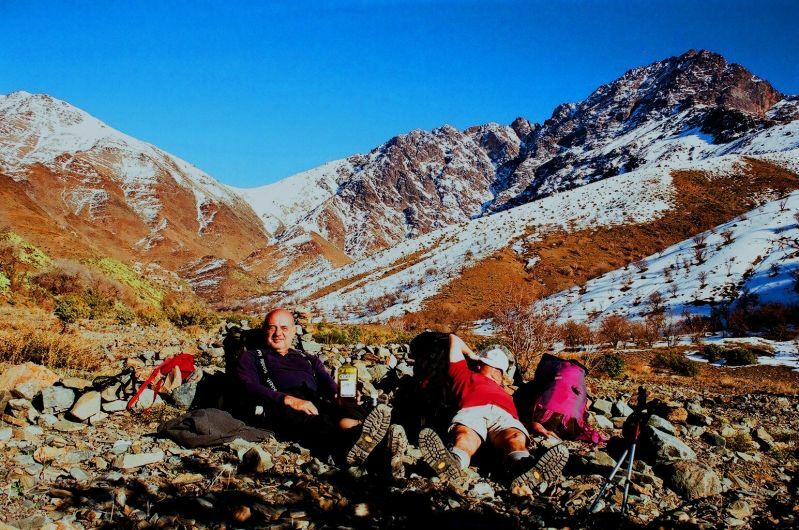 « Atlas Mountains: Space and Spciety ». Conference in honor of Professor Michael Peyron, jointly organised by the SHSS/AUI & IRCAM at Al Akhawayn University, Ifrane, April 8-9, 2010. Up to now most information under the « Tour Operator Watch » heading has been in English. However, as some readers have pointed out that there is a slight imbalance on this website in favour of English, for a change, we thought we might resort to the French language. Cette rubrique, qui compte déjà 10 parutions, s’est donnée comme but d’éclairer d’un coup de projecteur ce qui se passe sur la planète Tour-Operators/Atlas-marocain ; de suivre les tendances du marché, de façon à informer là clientèle montagnarde ; de la mettre en garde, le cas échéant, contre les supercheries toujours possibles. Chercher aussi, à démonter le discours des TO, à en exposer les failles, les demi-vérités et les pittoresques approximations de façon à amener le randonneur à y voir claire dans cette approche mercantiliste du Haut Atlas ; à disséquer le produit qui lui est proposé. En fin de compte, si ce n’est pas trop présomptueux de notre part, l’amener à faire son choix en toute équité. Eventuellement, à se prendre en charge lui-même, de monter son affaire avec quelques amis triés sur le volet, de recourir le cas échéant à un accompagnateur ou gîteur local, afin de mieux vivre son aventure marocaine en harmonie avec les populations amazighes de ces montagnes. Si tel est notre souhait c’est que nous constatons, au fil des années, une dégradation progressive des sites de l’Atlas marocain qui subissent des atteintes répétées, du fait du tourisme de masse auxquels ils se trouvent exposés, processus auto-destructeur qui est en passe de gâcher irrémédiablement certaines destinations ayant jusque-là fait le bonheur des visiteurs. 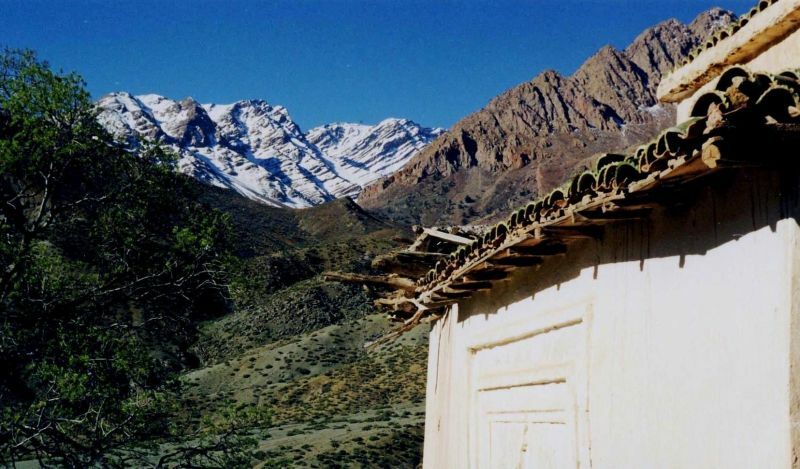 En effet, le pasage répété de « petits » groupes de 12-16 touristes provoque de la pollution environnementale (Tizlit), des graffiti (Toubkal), l’éffondrement de l’architecture traditionnelle (Imilchil, Telouet, Aremd), l’abandon de certains champs et chemins de traverse (Zat-Ourika), un phénomène de masse (Toubkal), joint à l’acculturation et l’ altération de l’hospitalité traditionnelle (quasiment toutes les régions), enlève son charme aux bourgs et contrées, décourage les visiteurs. On peut, sans se tromper, prétendre que le Haut Atlas est devenu un produit commercial à multiples facettes. Les agences ont puisé sans vergogne dans divers ouvrages publiés sur les montagnes du Maroc, dont la Grande Traversée de l’Atlas Marocain (GTAM) de Michael Peyron (éditions 1984 & 1988). Elles se sont inspirées largement les unes des autres, et, au terme d’une trentaine d’années, ont mis au point les destinations phares qui ornent leurs catalogues. 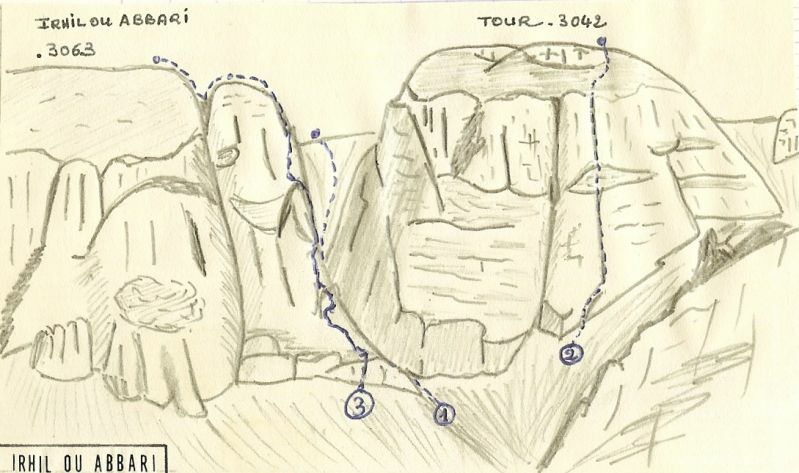 Parmi celles-ci, une tendance très nette se dessine depuis deux ou trois ans : la « Grande Traversée du Haut Atlas » (GTHA) des Bouguemez à Imlil en 22 jours. Un numéro hors série de Trek Magazine (2009) y a puissamment contribué ; dans une moindre mesure, sans doute, une lettre circulaire des années 1980, ébauchant le parcours en question, précisément en 22 jours, que l’auteur avait rédigé en réponse à des demandes d’information alors qu’il était Président du CAF de Rabat. Une étude approfondie du dossier nous a permis de constater qu’au moins 24 agences visent ce créneau des 22 jours pour une traversée axiale de l’Atlas. Il s’agit, pour une écrasante majorité, de TO français (Visages, Grand Angle, etc. ), à côté de quelques britanniques (Kendal Adventure, Classic Journeys, etc. ), ainsi que d’une poignée d’agences locales (Azul Travel, Maroc-Vert, etc. ), qui, quant à elles, prévoient 21 jours. Constatation qui appelle quelques remarques. 1) Il s’agit, à proprement parler d’un phénomène de saturation, liée à une banalisation pure et simple du produit GTHA, surtout lorsqu’on sait que les voyages ainsi programmés sont censés connaître plusieurs rotations par saison. Avec autant d’agences sur les rangs, chacune soucieuse de préserver sa part du marché, on va trouver un peu de tout dans le lot : de bons prestataires de service ; des moins bons, aussi. C’est dire que la médiocrité risque de faire son apparition, si ce n’est pas déjà le cas. Faire preuve de manque de professionnalisme, c’est bien là l’ultime tare pour un voyagiste. En effet à force de relever les bourdes, voire les attrape-nigauds qui émaillent les catalogues des agences on peut valablement s’interroger quant à leur sérieux sur le terrain. Quelques exemples : illustrer l’Ayyachi par une photo d’Oul Ghazi, dans l’Asif Melloul (! ), ou le damier de champs des Ayt Bougemmaz par une vue des gorges du Haut Dadès (!) ; l’orthographe fantaisiste (Yagourt pour Yagour) ; les coquilles (Mgnou pour Mgoun/ Armed pour Aremd) ; les inexactitudes (situer Zawit Ahansal dans le Moyen Atlas) ; ainsi que d’autres lacunes (parler de Megdaz sans évoquer les Chants de la Tassaout). Certains catalogues et/ou sites web, c’est du « n’importe-quoi » ! 2) Si les agences semblent être d’accord sur la pointure de 22 jours pour la GTHA, on distingue des nuances quant aux parcours. Heureusement qu’elles ne suivent pas toutes le même itinéraire ! 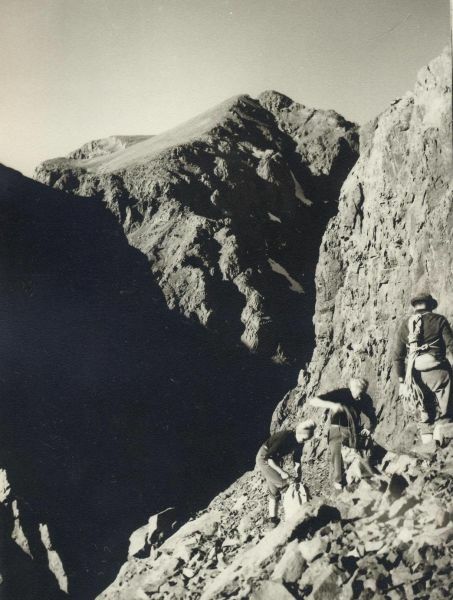 Cinq d’entre elles programment Imilchil-Telouet ; une Toufghyn-Telouet en 15 jours; 17 prévoient Bouguemmez-Imlil en y ajoutant l’ascension des sommets du Mgoun et du Toubkal (parfois aussi l’Inghomar), périple souvent annoncé comme « combiné Mgoun-Toubkal », ou « Raid Mgoun-Toubkal ». 3) En revanche, à prévoir grosso modo le même itinéraire, le système garantit une certaine uniformité mêlée de souplesse. En cas d’entente entres agences (la solidarité inter-TO semble exister), si tel voyage ne compte que peu d’inscrits chez l’agence A, on va les faire basculer chez des collègues plus chanceux en partance pour la même destination. Ainsi chacun y trouvera son compte. Ce serait le cas, notamment, de certaines agences lyonnaises et savoyardes qui, à la lecture de leurs programmes, semblent assurer une forme d’interchangeabilité. 4) Du point de vue du seuil de rentabilité, il existe parfois un minimum exigé, disons 8-10 participants. Les clients souhaitant partir en sous-nombre peuvent se voir pénalisés à hauteur de € 150 environ par tête. Du reste, certaines agences proposent d’emblée un forfait pour petit groupe d’amis, car tout le monde n’aime pas forcément se promener en compagnie d’inconnus à la fois illustres et nombreux. D’autres voyagistes, flairant là un créneau porteur, se mettent en quatre pour ces petits groupes, allant jusqu’à les inviter à formuler leur propre budget. Ou alors, on annoncera que les groupes seront limités à 10 participants. Signe révélateur d’un marché hautement concurrentiel, voire en crise. 5) On retiendra qu’en fin d’exercice la part du gâteau revient très nettement aux TO, alors que les locaux (accompagnateurs, gîteurs, et muletiers) sont les grands perdants dans cette affaire. Une étude toute récente par deux géographes marocains, en poste à l’IRCAM, ne laisse aucun doute à ce sujet. [cf. M. Ait Hamza, & H. Ramou, « Le tourisme en milieu rural et le développement local », Marocco : turismo e sviluppo locale, (M. G. Lucia & H. Ramou, éds. ), Paris, L’Harmattan, 2010 : 177-196]. En somme, les locaux continuent à se faire exploiter à distance par des acteurs étrangers, situation déjà dénoncée par l’auteur il y a 30 ans. 6) Il ne faut pas croire, non plus, que tous les voyages programmés aboutissent sur le terrain. Assurer le remplissage sur une destination n’est pas toujours aussi évident qu’il y paraît ; l’Atlas marocain est une destination privilégiée, mais il suffit d’une menace d’attentat pour tout remettre en cause, si ce n’est la baisse du pouvoir d’achat lié à la crise économique. Le déchet serait même assez élevé, bien que nous ne disposons d’aucune donnée chiffrée là-dessus. 7) Une minorité d’agences se distingue, par rapport à cette GTHA en 22 jours, en introduisant des formules différenciées, et c’est tout en leur honneur. La Balaguère, par example, prévoit 15 jours pour sa « mosaïque berbère » sur Imilchil-Bouguemmez ; pour la même durée elle programme un Toubkal-Essaouira via Tinmel, l’Aghbar, le Tichka, et le Seksawa. Le voyagiste Club Aventure, quant à lui, annonce un Imilchil-Bouguemmez en 15 jours. A scruter la liste des voyagistes on constate que certains, autrefois présents sur ces créneaux, manquent à l’appel ; sans doute en raison de la crise ont-ils dû « boire le bouillon ». Dure loi de l’offre et de la demande sur un marché hautement compétitif à la déontologie impitoyable. 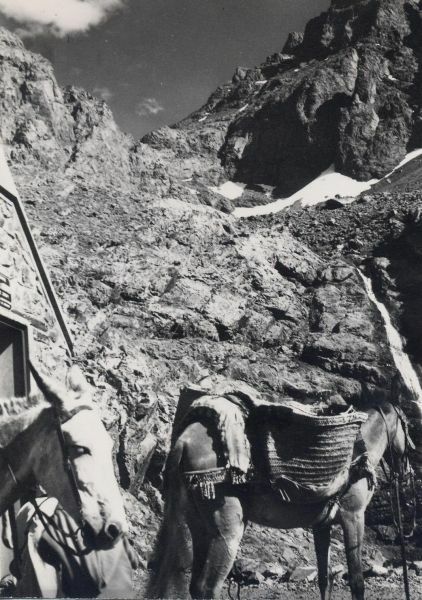 D’autres encore, et c’est le cas des britanniques Sherpa Travel et Exodus, semblent abandonner cette GTHA sans doute jugée hyper-fréquentée, banalisée, préférant se déployer sur des créneaux plus porteurs comme le Toubkal en hiver, le tourisme côtier ou oasien. Car, à lire les blogs d’usagers, il apparaît que l’on repproche aux TO de faire preuve de manque de créativité et d’imagination. Surtout dans leur façon de suivre d’une année sur l’autre des itinéraires identiques. Si tout le monde fréquente les mêmes sentiers en même temps la saturation risque, à la longue, de dégoûter les usagers. On sait que le randonneur grenoblois ou savoisien n’aime pas se retrouver seul, mais, tout de même, de là à jouer des coudes avec une foultitude de ses semblables en des bivouacs collectifs comme les Neltner ou le camp de base du Mgoun, c’est une autre paire de manches. A ce moment-là pourquoi chercher à tout prix le dépaysement au Maroc si c’est pour y retrouver la même ambiance qu’un Dimanche de Pentecôte en haut du Taillefer ou de la Tournette ? Les TO, sensibles à ce genre de critique, répondent par une mesure de souplesse : à l’intérieur d’un trek comptant une quinzaine de participants, on créé deux, voire trois sous-groupes selon des critères d’affinité. Chaque composante du groupe va désormais progresser à un rythme qui lui est propre ; emprunter éventuellement des variantes d’itinéraire, quitte à se retrouver en un campement commun un jour sur deux. Autre tendance relevée, les limonadiers de l’aventure qui proposent la GTHA en 22 jours se targuent de pratiquer une forme de « Tourisme responsable », voire « durable » : formule floue, fourre-tout qui sert à donner à ces agences bonne conscience, à rassurer leurs clients, sans que l’on sache vraiment de quoi il s’agit. Esbroufe et faux-fuyants; nous pensons que tout cela flaire l’effet d’annonce plutôt qu’autre chose ! Cela va surtout permettre aux voyagistes de continuer impunément à mettre à mal les dernières destinations encore intactes, ou ayant conservé un résiduel brin de charme. 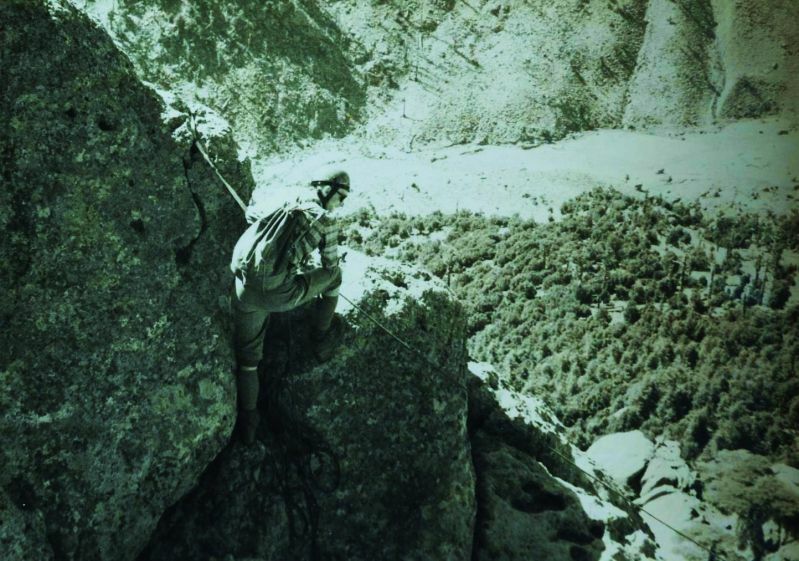 Donc, en définitive, si vous voulez randonner en paix dans les monts de l’Atlas marocain, préparez sérieusement votre affaire, documentez-vous à fond, impregnez-vous du Maroc par la lecture, car ce genre de voyage se mérite. Munissez-vous de la carte Michelin du Maroc, fort utile pour toute planification de périple ; éventuellement du Routard (du Rough Guide ou LPG si vous êtes anglophone). Puis allez-y en voyage individuel avec 2-3 amis de votre choix ; sur place faites-vous accompagner par quelqu’un du pays, et à l’étape essayer de loger chez l’habitant. Adoptez une attitude ouverte, sympa, sans misérabilisme aucun. C’est la meilleure formule pour aborder le monde amazighe (berbère). L’auteur de ces lignes ne fait pas autrement depuis 45 ans. Plusieurs chapitres rédigés pour la plupart en langue anglaise et concernant l’histoire et la culture berbère, ainsi que certains aspects du tourisme de montagne dans l’ Atlas marocain, figurent déjà dans ce site web. Dans le cas présent il s’agit d’ascensions effectuées principalement dans les années 1960 et 1970. Les sommets de l’Atlas se prêtent, en effet assez bien à des courses de neige peu techniques en hiver, à des escalades faciles en période sèche. Que l’on n’y cherche point, par conséquent, des descriptifs de grimpettes pointues dans les gorges du Todgha ou les environs de Zawit Ahansal, actuels « spots » à la mode attirant tout ce que le pays compte comme visiteurs motivés par le VI+, sinon rien ! 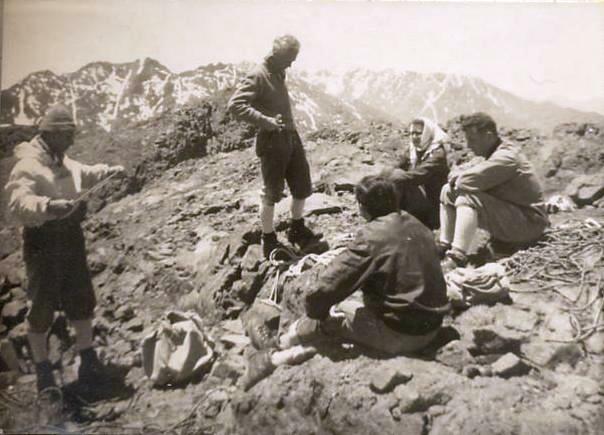 A tout seigneur, tout honneur ; une bonne partie de ces courses se situe dans le massif du Toubkal, reprenant là de nombreuses classiques consignées naguère par Dresch et Lépiney dans leur premier guide des années 1930. La roche, mélange de rhyolite et d’andésite, offre rarement des faces en bon rocher, exception faite pour les Clochetons de l’Wanoukrim et l’Angour. Le plus souvent c’est du rocher pourri – l’une des raisons pour lesquelles le massif n’a jamais eu vraiment bonne presse auprès des grimpeurs internationaux. 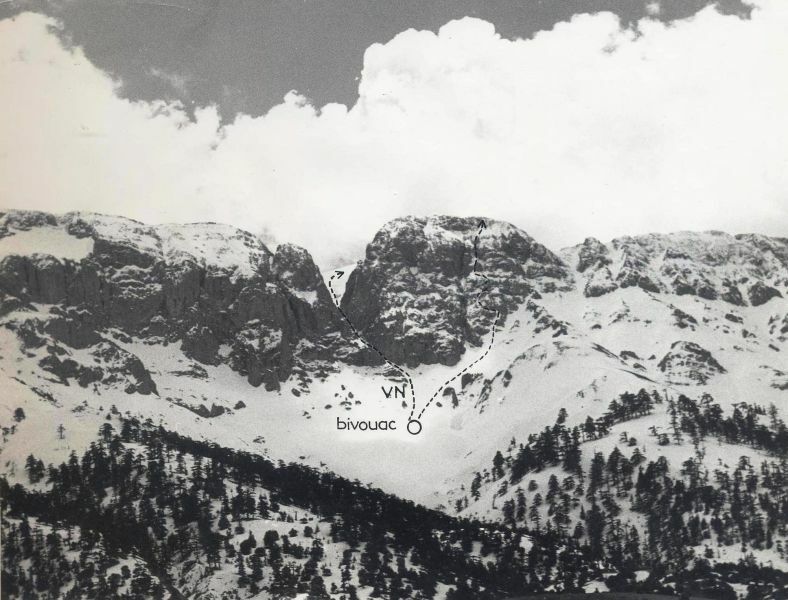 Troisième sommet du Maroc avec ses 4.083 mètres, le Ras n-Wanoukrim se remarque de fort loin alors que l’on gravit le vallon du Neltner, surtout son couloir NE, profonde zébrure qui barre toute la face et conserve la neige jusque tard en saison. Fin-avril/ début-mai les conditions sont bonnes, du moment que le gel nocturne aura fait son travail pour assurer une surface dans laquelle crampons et piolets vont mordre correctement. Le couloir se redresse à mi-parcours jusqu’à 40° ; c’est un bon exercice, même assez grisant, permettant au débutant de dominer la pente, de vaincre une légère appréhension. Cependant, il s’agit d’une course totalement dépassée à l’époque actuelle ; le couloir NE du Ras se descend désormais à ski ! Pas de baudrier, non plus, l’encordement se faisant autour de la taille, à la manière ancienne. Car nous sommes en 1968, année fatidique où il est devenu interdit d’interdire, et où bien d’autres certitudes ont été battues en brèche ! Pour l’heure, l’escalade, tout en restant aérienne, est facile, rassurante, de généreuses « baignoires » offrant d’excellentes prises. Ce deuxième ressaut, légèrement exposé, est sans doute la seule difficulté du parcours, mais à escalader cela en second, « ça passe » comme une lettre à la poste. 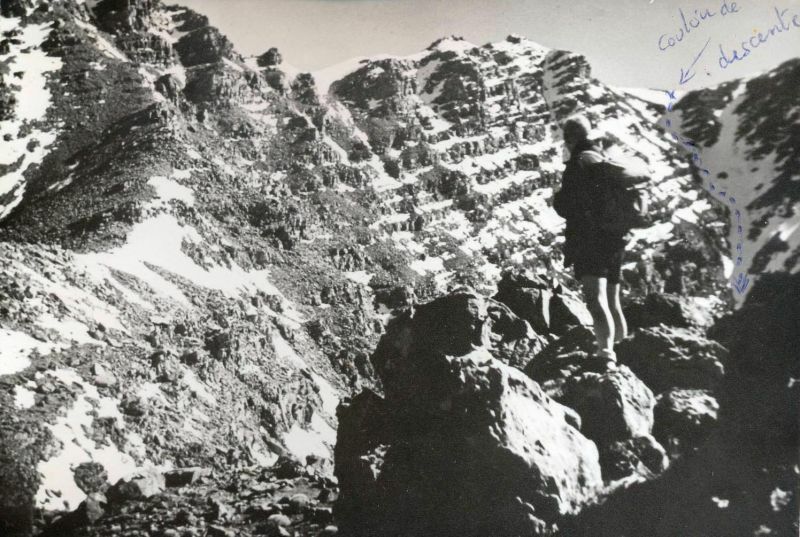 On retiendra que cette course est plus intéressante en avril/mai, car en sortant au Tizi n-Toubkal on peut y retrouver des porteurs ayant monté vos planches, avec à la clef une bonne descente dans l’Ikhibi Sud. En face du Toubkal se situent les Clochetons de l’Wanoukrim, une série de petits pics entre l’Afella et le Biguinoussen. On les atteint au prix d’une saine « bavante » directement depuis les refuges Neltner en prenant directement à l’ouest par un raide couloir d’éboulis. L’approche est plus longue que l’escalade proprement dite (rien que pour ça la course ne plairait pas aux fainéants parmi les grimpeurs modernes), celle-ci ne comptant qu’une demi-douzaine de longueurs de corde sur de belles dalles se terminant par une cheminée pour accèder au Clocheton central. A défaut de chaussons, Louis Villard a mis ses chaussures légères d’escalade pour être à même de « gratonner » correctement sur le genre de petites prises que l’on trouve sur les Clochetons. 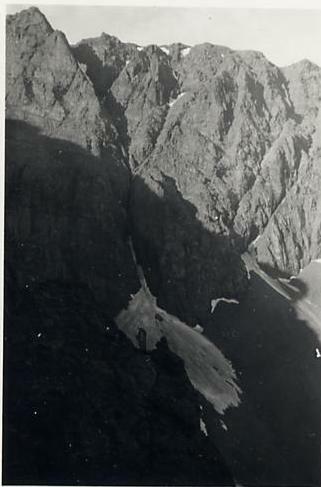 Il s’agit de ne pas s’en priver, car c’est un des rares endroits dans le massif du Toubkal où le rocher est « potable ». Assuré par le haut, René Proton, chaussé de « Gaston Rebuffat » classiques, s’élance à son tour dans l’escalade des Clochetons. Il porte également un magnifique knicker en drap de Bonneval et un sac à dos de marque « Millet » que l’on avait tous à l’époque, d’un modèle inusable, car fait en toile, avec un fond protégé, en cuir. De nos jours, selon nos impitoyables critères de marketing privilégiant le jetable, un tel produit ne serait plus commercialement valable ! Un peu plus loin sur la même arête se trouve le Buiguinousen (4.002 mètres), sommet aux formes lourdes, rehaussé d’un clocheton – l’Aiguille. Celle-ci se livre au terme d’une escalade PD ; la petite face sous le sommet permet de re-descendre par un court rappel assez élégant (voir ci-dessus). Toujours dans le vallon d’Ait Mizan qui dessert le Neltner, dominant Sidi Chamharouch et la combe qui livre accès au Tizi n-Taghrat, se dresse un sommet secondaire totalement délaissé du grand public : le Taksout n-Ouarout. Plutôt qu’une face continue, il s’agit d’un étagement de ressauts abrupts discontinus, mais renfermant quelques bons passages d’escalade. La course étant peu engagée, nous avons pris deux sacs pour trois grimpeurs de façon à ce que l’homme de tête soit parfaitement libre de ses mouvements, comme pour négocier cette intéressante fissure ci-dessus. 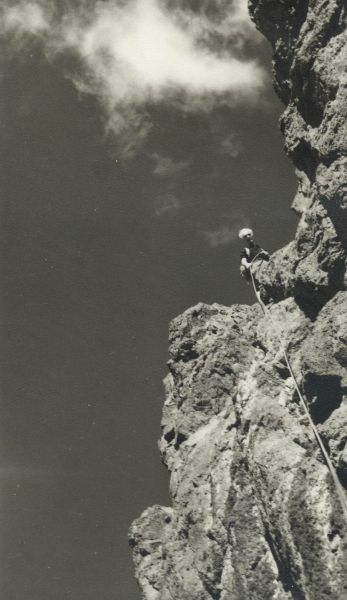 L’altitude de départ étant relativement basse (2.400m) on notera la présence de buissons (phénomène par ailleurs peu courant dans le Toubkal) à proximité directe de la voie. Pour une course relativement modeste, nous avons été surpris par sa longueur, n’ayant pas regagné Imil avant 16h30. 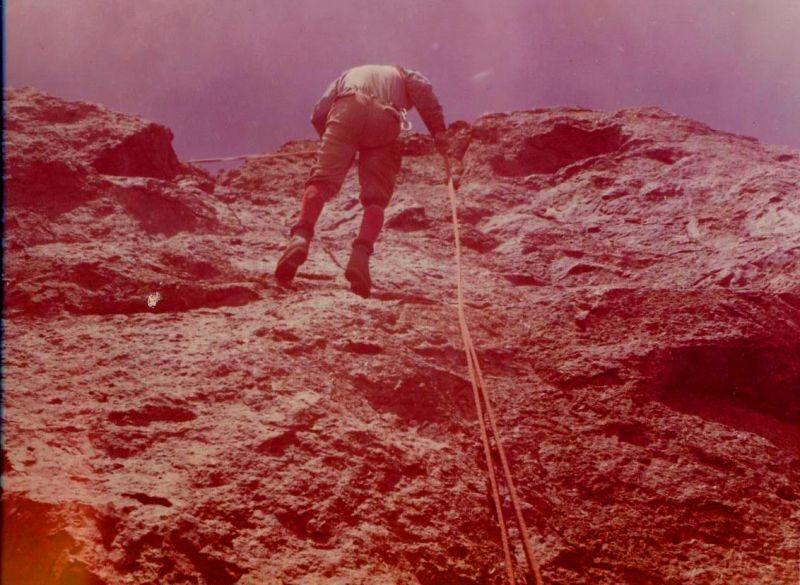 Du reste, au retour, Lachen « Tenzing » nous confirmera que le Taksout est une affaire plus sérieuse qu’elle n’y paraît de prime abord. La combe du Lépiney, immense cirque désolé, sauvage, dominé par l’envolée des arêtes rocheuses du Tazaghart, constitue la partie la plus alpine, la plus pittoresque du massif. Cela n’est pas sans rappeler le sud de l’Oisans. De plus, jugé peu à la mode, le coin est nettement moins fréquenté que le Neltner, point de passage obligatoire pour tous les obnubilés du Toubkal. Donc, tranquilité assurée. Avec en prime, loin des foules, un coquet refuge du style maison de poupées. Mais surtout, au creux d’un ravin encaissé, se cache un véritable joyau : le Couloir de Neige. C’est pratiquement le seul endroit dans le Haut Atlas où, sur près de 500 mètres de dénivelée, l’on retrouve de la neige en toute saison. 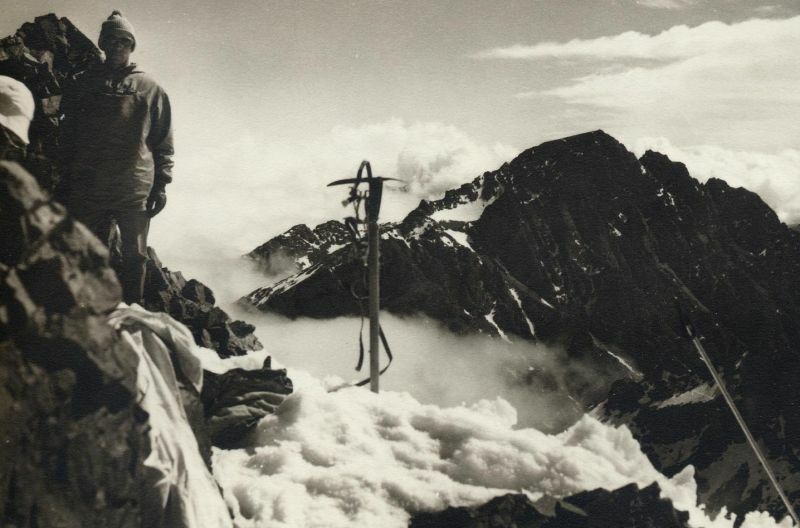 Aussi, à l’époque de l’alpinisme classique d’après-1945, c’était LA course à faire dans le secteur, un peu comme le Couloir de Gaube au Vignemale (Pyrénées). Les conditions, toutefois, y ont toujours été très changeantes, selon l’enneigement de l’année en cours. Au-delà du ressaut l’ascension re-devient facile ; il s’agit simplement de poser un pied devant l’autre jusqu’en haut du couloir, en prenant garde aux crampons qui peuvent « botter » à ce moment-là en raison du soleil qui ramollit la neige. En plein été ceci peut provoquer sur le plateau sommital du Tazaghart le phénomène spectaculaire des nieves penitentes. 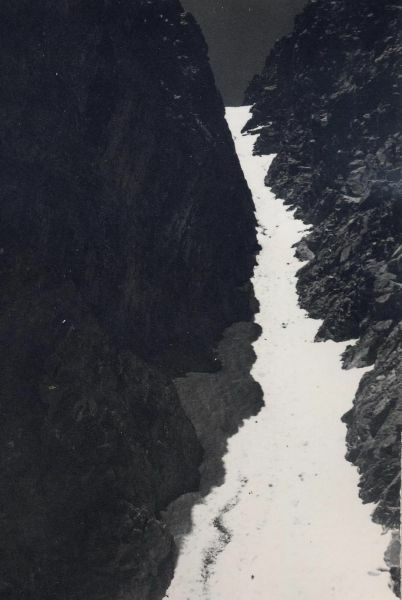 Le Couloir en Diagonal, autre course classique du Tazaghart, présente une partie en neige moins redressée, et moins importante que dans le Couloir de Neige, n’offrant guère d’obstacle. Vers le milieu une partie facile : on remonte une pente de cailloutis. Ici, René Proton est en tête lors du franchissement du ressaut, marqué par un pas de III, qui ferme le couloir vers le haut. Le ressaut franchi, nous nous attardons juste le temps de récupérer un anneau de rappel abandonné sur place la semaine précédente par des grimpeurs espagnols. Un simple pierrier reste à parcourir afin d’atteindre le plateau sommital, perché sous le ciel à près de 4.000 mètres. De nos jours, ces deux couloirs du Tazaghart (et d’autres encore) se parcourent plutôt du haut vers le bas, et à ski, comme il se doit ! Avec ou sans pose de rappel, selon la forme, le « mathos », les conditions. Imposante et très alpine montagne, l’Akswal domine Tacheddirt de ses 3.910 mètres. Deux couloirs sur son versant N retiendront l’attention des ascensionnistes : l’Ighzer n-Oukswal, contenant un important névé semi-permanent dans sa partie inférieure, où, par année de bon enneigement, le CAF venait autrefois pratiquer de l’école de glace en plein été; et l’Ighzer n-Temda menant jusqu’à la brèche de l’Aghzan. En plein hiver la neige d’avalanche s’entasse au pied du couloir fournissant à Bernard Pagès l’occasion d’étrenner son casque d’escalade, ses crampons Salewa à 12-pointes, ainsi que son très classique piolet Simmond au manche en bois. Par la suite nous avons tenté l’ascension du couloir mais avons dû rebrousser chemin pour des raisons liées à l’horaire ainsi qu’à la qualité de la neige. Tard en saison de l’année suivante nous avons profité d’un enneigement record pour retourner à l’Ighzer n-Temda. Ayant tranquillement bivouaqué au pied nous disposons du temps nécessaire pour mener à bien notre entreprise. Nous sommes accompagnés cette fois du jeune Loubiès, et de Michel Morgenthaler, qui grimpe torse nu. Les conditions soint parfaites : bons compagnons, bon « mathos » (tous équipés de crampons avec pointes avants), temps ensoleillé, neige de printemps, pente assez soutenue ; la course se déroulera sans problème aucun. Ayant coiffé le col de l’Aghzan nous bénéficions de vues en direction de l’Azrou n-Tamadot, les Wanoukrim, le Tazaghart. Pour regagner Imlil nous prenons droit devant nous par un long couloir encaissé. En cours de route, de gros blocs se détachent sous l’effet du rayonnement solaire ; nous les évitons sans difficulté. En 1972, nous y sommes retournés à deux. 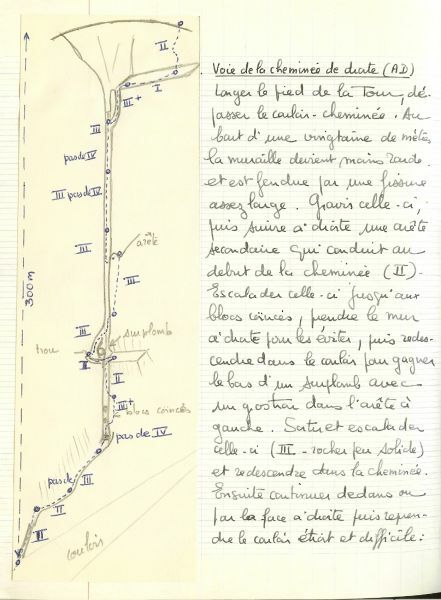 Le document ci-dessous, pris au départ de la descente, montre clairement la raideur relative de la pente. Inutile de le préciser. Vous l’avez deviné : à l’heure actuelle ce couloir est fréquenté essentiellement par des skieurs à la recherche du frisson ! Tout visiteur au plateau de l’Oukaimedden, surtout s’il y pratique le ski, connaît bien la masse imposante de l’Angour (3.615 mètres) qui ferme l’horizon au Sud. C’est une haute barrière apparemment infranchissable, régulièrement blanchie par les neiges hivernales, agrémentée en son extrémité E de deux tours rocheuses. Tout grimpeur digne de ce nom, l’apercevant pour la permière fois doit ressentir l’irrésistible envie de la gravir, de la couronner. D’autant plus qu’elle renferme plusieurs voies d’escalade, aussi bien sur sa face N que sa face S.
L’auteur de ces lignes a eu le privilège de rencontrer un montagnard l’ayant grimpé soixante-seize fois. Il s’agissait de Louis Villard, baptisé affectueusement « Louis Soixante-seize » (! ), ceci afin de le distinguer d’un certain monarque malheureux. Dans les années 1960-70, cet industriel casablancais venait en 36 heures gravir son pic préféré, en appliquant ce qu’il appelait « la productivité en montagne ». Partant Samedi à midi, il fallait franchir la distance séparant Casa de l’Ouka, « faire » son sommet préféré, histoire de se défouler, puis se retrouver dans son bureau Lundi matin, frais et dispos, afin d’affronter une nouvelle semaine de boulot. Nous sommes (R. Proton, L. & R. Villard, L. Baude), au sommet de l’Angour, par un radieux Dimanche de fin-mai sous le ciel bleu d’Afrique, à ranger notre « mathos », contents d’avoir gravi la voie classique de l’arête N (PD). En toile de fond le Haut Atlas, « toit du monde » des anciens, aux couloirs encore bien garnis de neige, reste agréable à contempler. 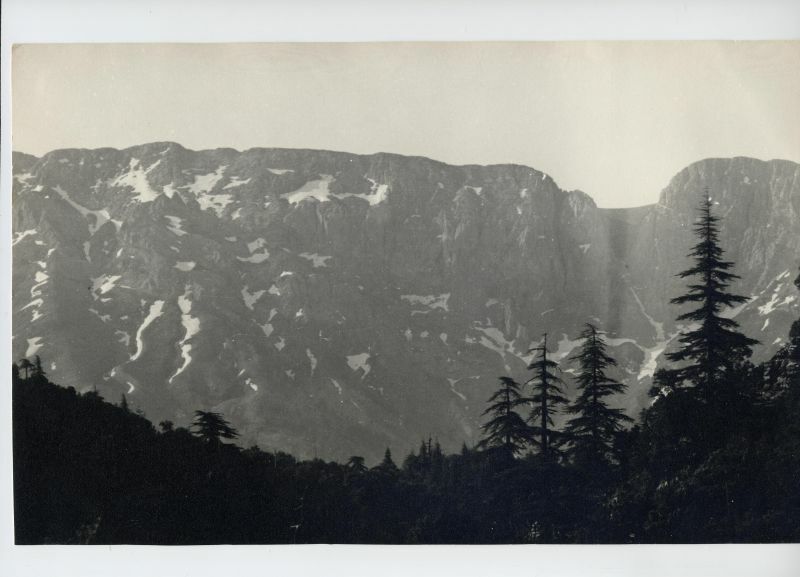 Ici, harnaché de son sac, du piolet et d’indispensables pitons, Louis Villard monte d’un pas décidé depuis le Tizi n-Itbir vers « La Vire » de l’Angour. Nous étions venus en weekend à deux depuis Casa pour aborder la montagne en conditions hivernales. Les conditions sont prometteuses : grand beau temps de janvier, air sec et froid, une neige dure qui crisse sous les bottes, et bientôt sous les crampons – dès que la pente se redresse. 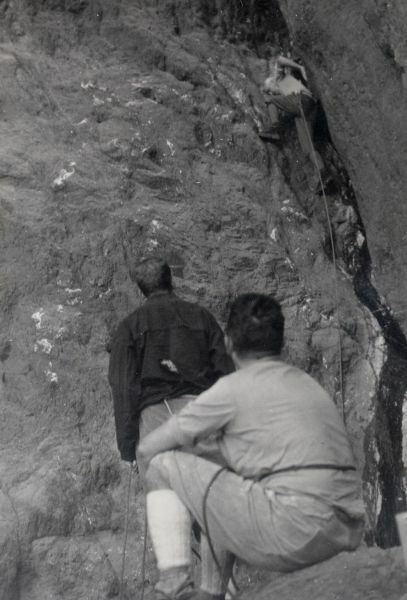 « La Vire » est un cheminement étroit, suspendu au-dessus du vide, permettant de contourner la Face NE de l’Angour, jusqu’à sa facile arête E. D’un parcours aisé en été, en hiver le passage est tout autre, nécessitant une traversée délicate, en équilibre sur les crampons. Quant à la Face NE, c’est une tranquille bien qu’aérienne course en AD (l’été surtout), sans doute la plus prisée de l’Angour. Villard est satisfait ; en 70 fois ou plus qu’il y vient, c’est la première fois qu’il gravit l’Angour en plein hiver. Ce sera l’un des dernières sorties pour ses vieux crampons à 10-pointes ; peu après il va passer aux pointes en avant. La descente s’effectuera via le raide couloir situé entre les deux tours sommitales. Au retour de la course, Villard s’offre un Fernet-Branca à l’hôtel – « Chez Juju » - car il prétend souffrir d’indigestion, mais un peu aussi pour fêter l’occasion ! 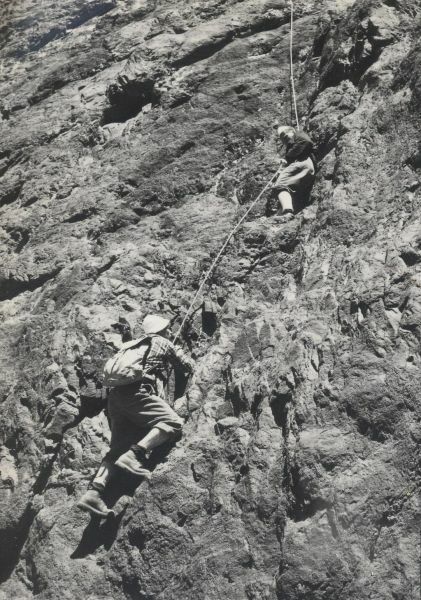 Occasion tout à fait différente : la 41bis, escalade classique de la Face S de l’Angour. Ce sera un de nos meilleurs rendez-vous estivaux de la saison 1966. Toujours dans le cadre d’un weekend de 36 heures, Villard, Proton, Baude, Monier et l’auteur, se retrouvent au diner le Samedi soir « Chez Juju ». Le lendemain, après un petit déj. matinal, le groupe gagne la face S par un itinéraire détourné. Comme il se doit, Villard attaque en tête par une belle fissure. Puis c’est le tour de Monier. Comme on le voit, il semble avoir des problèmes d’adhérence au départ ; heureusement que Louis Baude est là ! De facette en couloir, de couloir en terrace, la 41bis prend lentement de la hauteur, la difficulté moyenne restant de l’ordre de PD. Ragaillardi, Monier à son tour peut assurer son collègue Proton. Débouchant sur le plateau sommital vers midi, nous y trouvons un athlétique chleuh muni d’un fusil, qui nous avoue être à l’affut des mouflons. En effet, des mouflons il n’y en avait guère dans les années 1960 ; grâce à des mesures de protection la situation a depuis changé. Il était parfois agréable, histoire de changer un peu de terrain de jeu, de prendre la direction d’autres massifs. 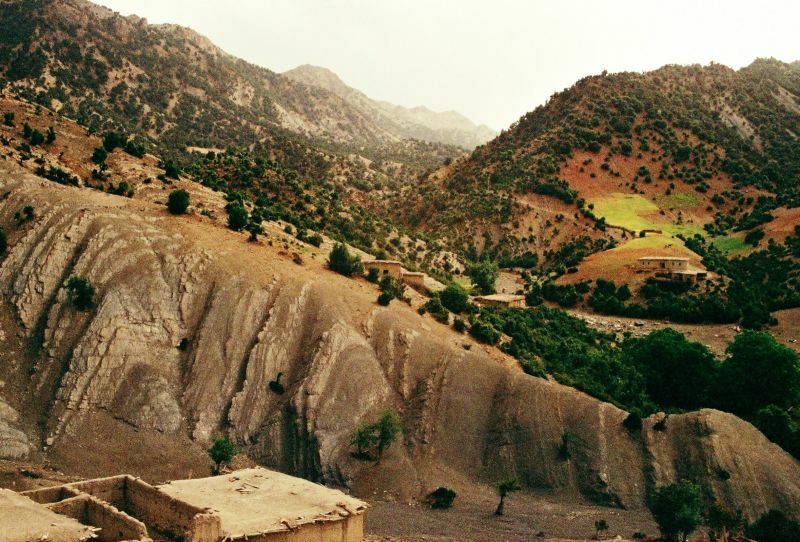 Le Haut Atlas occidental, entre Amzmiz et Taroudant, était de ceux-là. L’accès est relativement aisé par la route de Talat n-Ya’qoub, desservant le Tizi n-Test. 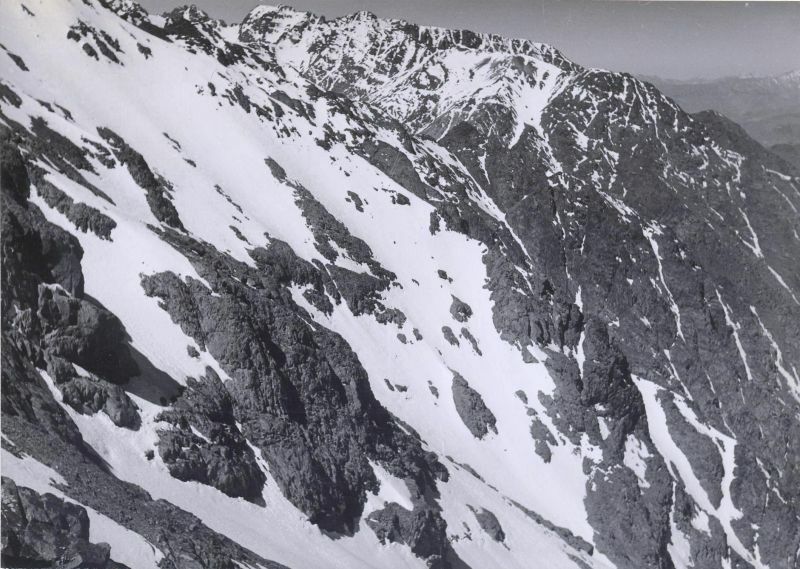 Cette photo a été prise sur l’arête N de l’Idoudan (idudan, ‘les doigts’), sommet dominant la vallée de l’Ogdemt entre l’Erdouz et l’Igdet. Nous avions logé dans le pittoresque village d’Arg, ceint de noyers, principal bourg de ce haut pays. René Proton, en manque d’escalade cette saison-là, s’amuse sur quelques rognons rocheux qui dominent le col, mais ne peut s’employer à fond, étant chaussé de « Trappeurs » de marche, insuffisament rigides pour tenir sur les petites prises. Les conditions sont typiquement automnales : plafond assez bas, saupoudrement de neige sur l’Igdet au fond. Plus à l’ouest se situe une contrée semi-mythique, jadis cher à Jacques Berque, le Seksawa avec ses roitelets médiévaux et sa grande sainte, Lalla ‘Aziza. Ses montagnes abruptes, aussi, décrites par Ibn Khaldoun – chroniqueur médiéval célèbre – comme « flirtant avec les étoiles ». De bonne heure, le Jbel Ikkis (Timezgidda Tindri) avaity attiré nos regards. Après la facile face S en 1967, nous étions revenus à l’automne de 1973 faire l’ascension de sa face N, de toute évidence plus escarpée. En fait la course se traduisit par une escalade que l’on peut à peine côter PDinf., même si nous nous sommes encordés par prudence. Cependant, c’est un sommet panoramique ; il s’agit d’un superbe belvédère. Nous n’y sommes retournés qu’une trentaine d’années plus tard lors d’une rando dans le secteur dont le déroulement a été sérieusement perturbé par l’arrivée du mauvais temps. Le cliché ci-dessus a été pris lors de notre première reconnaissance dans le Seksawa en mars 1967. Si nous avons pu escalader l’Ikkis, en revanche, il faudra attendre plus longtemps pour ajouter le Ras Mouylay ‘Ali à notre liste de sommets. Lors de notre retour vers Lalla ‘Aziza, après le passage du Tizi n-Tebgourt avec assistance muletière, nous avons repris nos sacs. Ici, nous sommes en train de longer le bas de cette coulée d’avalanche. Rude journée d’une dizaine d’heures passée sur les sentiers. Il aura fallu, pour gravir le Ras Moulay ‘Ali, attendre le coeur de l’été 1969. Avec René Proton et Maurice Forseilles nous avons abordé le Haut Selsawa depuis Lalla ‘Aziza en suivant le fond d’oued sous un soleil ardent, échappant de peu d’être emportés, suite à un orage, par une vague de fond qui a tout balayé sur son passage jusqu’en plaine. Nous avons trouvé gîte et couvert chez notre vieille connaissance Si Brahim Lamin, à Imi n-Wasif. Le lendemain, partis à la fraïche, nous gagnons l’antique bourg d’Asif Lahlou, et de là, un vallon étroit livrant accès au cirque N du Ras Moulay ‘Ali. Chemin faisant, nous recrutons un jeune montagnard qui accepte, pour une somme modique, de nous guider. Ayant gagné une large brèche sur l’arête W, de là nous rejoignons le sommet : platteforme rocheuse haut perchée sous le ciel. 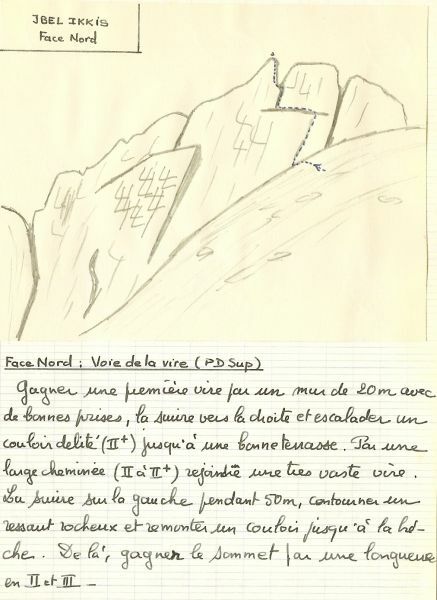 Nous redescendons en traversée vers le ravin d’Asif Lahlou, admirant en chemin des flammes de pierre qui nous rappellent un dessin dans Le Maroc Inconnu de Jacques Felze, un des premiers pionniers à avoir parcouru les hauteurs de ce massif. 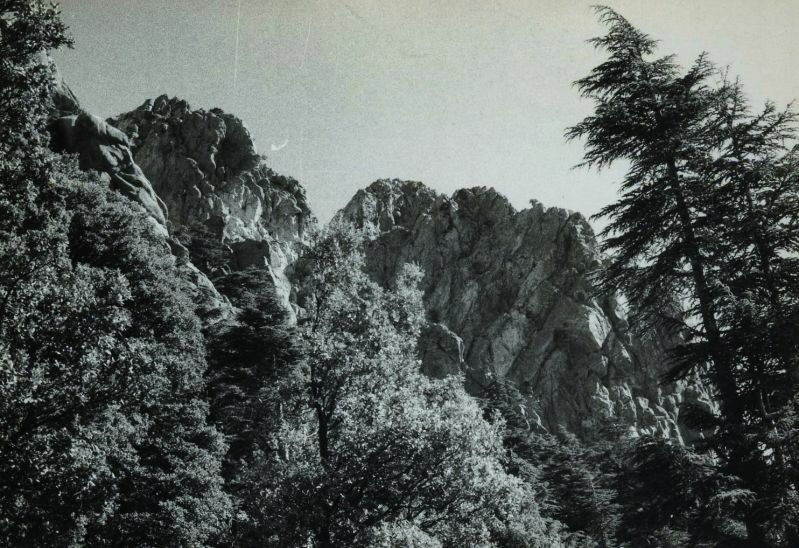 Photo prise lors de notre traversée du Ras Moulay ‘Ali en août 1969 et laissant entrevoir des possibilités escalade fort alléchantes sur ce sommet formant partie intégrante de l’imposante barre rocheuse nord du plateau du Tichka. Depuis le village de Tidsi, ascension d’un sommet secondaire, satellite du Bou Oughiwl : l’Isk n-Yahya (3.450m). 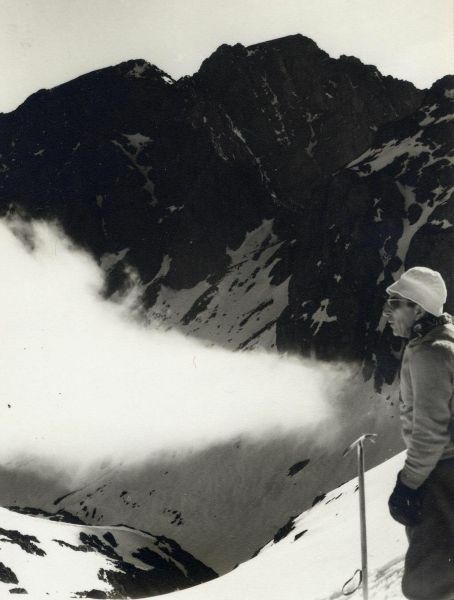 Celui-ci présentait d’excellentes conditions d’enneigement tardif en juin 1971. Heureusement les pentes terminales, légèrement plus raides, étaient en neige molle (cf. ci-dessus). 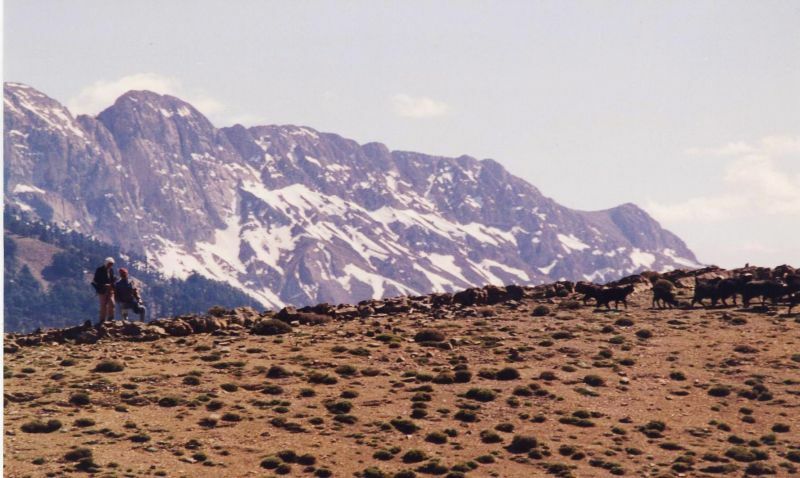 Le Tistwit, un des sommets les plus remarquables du massif de Telwat, domine le paysage entre Toufliaht et Zereqten lorsqu’on vient de Marrakech. D’une topographie complexe, il n’oppose guère de résistance au randonneur alpin décidé qui l’aborde au départ de Titoula, accessible depuis Taddert (route du Tizi n-Tichka). Seul point délicat : l’assez raide couloir de Sardyl (en neige au printemps), emprunté pour descendre du plateau sommital, nécessite un brin de prudence, sa surface pouvant être molle l’après-midi. Cliché pris tout près de la source de l’Asif n-ou Hansal, qui sort du pied de l’Aoujdad, Cirque de Taghia, à deux heures en amont de Zawit Ahansal. Nous y étions venus en un weekend depuis Casablanca, en simple reconnaissance. 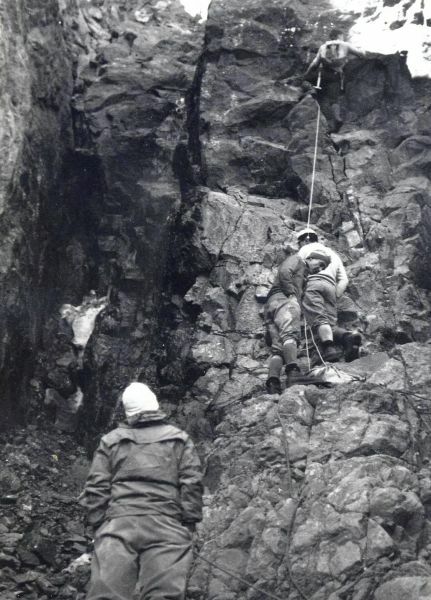 A l’époque le coin était pour ainsi inconnu, mais on subodorait un potentiel en ecalade quasi-insondable ; d’après Louis Villard un ensemble de falaises était connu chez les grimpeurs locaux des années 1950 sous la dénomination de »barrière infranchissable ». Un accès fort difficile – par la Cathédrale ou par l’Azourki, la piste était tout aussi mauvaise - jouait un rôle des plus dissuasifs. Par la suite des grimpeurs polonais sont venus en exploration ; enfin Bernard Domenech, surtout, en a lançé la prospection. L’Aoujdad, la Taoujdat, l’immense face de Tagoujjimt n-Tsiwant sont devenus célèbres. A l’heure actuelle le Cirque de Taghia, avec son gîte, constitue la Mecque des grimpeurs de haut niveau au Maroc. Nombreux sont ceux qui connaissent l’arrière-pays de Tounfit, et son maître-sommet, le Ma’asker, montagne anodine en apparence car perçue comme simple prolongement à l’Ouest de l’Ayyachi; bien rares, par contre, ceux qui se doutent qu’en son extrémité occidentale il cache quelques belles escalades calcaires. Modeste 3.000, sommet très peu à la mode, l’Ighil ou Ahbari présente sur une longueur d’un kilomètre ou plus, dominant de belles cédraies, une série de facettes fort redressées renfermant d’intéressantes escalades. 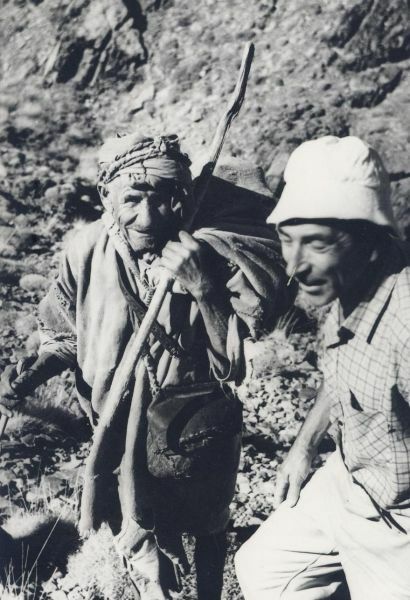 La prospection du massif, l’oeuvre de résidents français au Maroc, dont Claude Aulard, Denis Dourron et Bernard Domenech, ne remonte qu’au début de la décennie 1970. 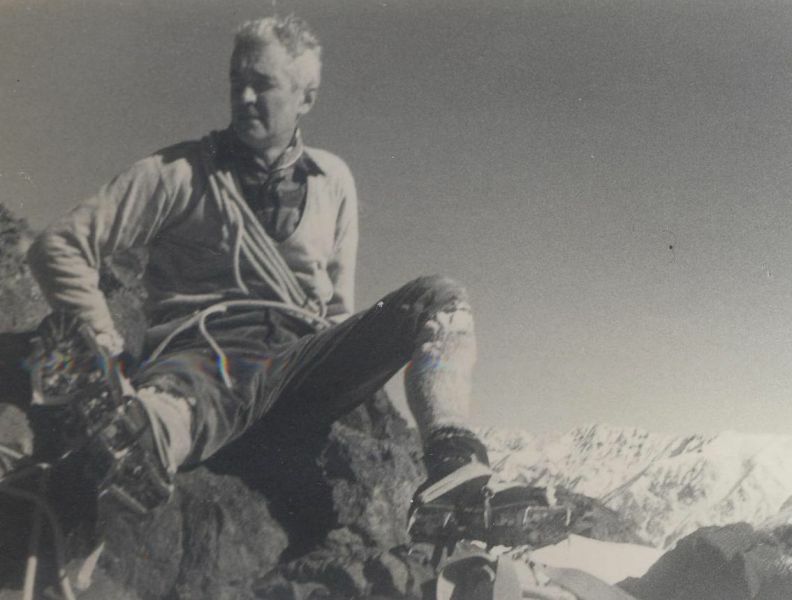 Une première ascension par M. Forseilles et l’auteur, entreprise au départ du village d’Assaka à son pied, a été effectuée en mai 1970. La voie empruntée remonte le couloir par une langue de neige entre les deux donjons rocheux où un bloc coincé offre l’unique difficulté du parcours. C’est devenu la voie normale. Une équipe plus étoffée, comprenant l’auteur, R. Proton, C. Aulard et B. Soulier est revenue à la charge en septembre 1971. Après installation (avec assistance muletière recrutée à Assaka) d’un bivouac just sous la face, et une nuit reposante, le donjon de droite a été gravi par deux cordées, suivant deux voies sensiblement voisines, cotation de l’ensemble : AD. Les chutes de parpaings furent rares pendant l’ascension, la roche s’avérant solide dans l’ensemble. Près de deux années plus tard, à l’automne, deux co-opérants français basés à Fès, Denis Dourron et Christian Avrain gravirent la face sous le sommet-3042 par une variante de la même voie, comportant un ensemble de III, avec deux pas de IV (cf. croquis ci-dessous). 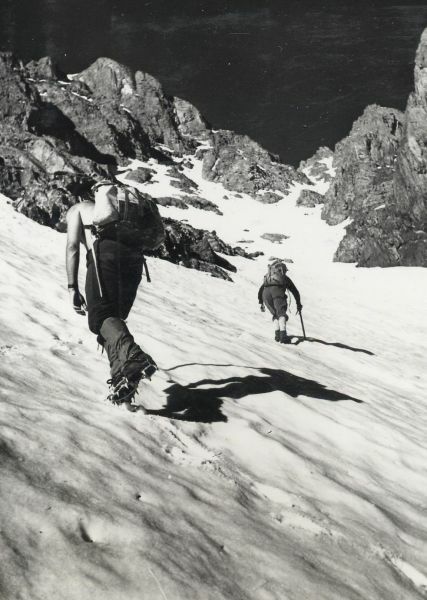 A la fin du printemps 1973, l’auteur y retourna en compagnie de J. Vautier et D. Dourron pour une simple ascension par la VN, suivie d’une courte traversée de l’arête vers l’E, puis d’une descente par le versant N par une succession de couloirs. Ce fut l’occasion d’une légère déception sur le plan de l’observation faunistique : ayant aperçu au loin ce que nous avions pris pour des mouflons, nous fumes déçus de constater, de près, qu’il s’agissait de simples moutons ! On voit bien à droite, le couloir qu’emprunte la VN ; à gauche l’arête traversée, ainsi que le versant parsemé de couloirs enneigés par lequel s’effectua notre descente. Ce névé persiste assez tard en saison (août certaines années) ; on devine le bloc coincé au-dessus du resserrement du couloir . Cliché pris depuis le Tizi n-Tiboulkheyrin sur le sentier direct de Tounfit à Lmerri ; enneigement de fin-mai. Derrière le Ma’asker, en direction d’Imilchil, se situe une guirlande complexe de chaînes avoisinant les 3.000 mètres. A l’époque, depuis Tounfit on suivait la piste automobile qui, via Agoudim et l’Aqqa n-Ouyyid, rejoignait la Maison Forestière de Tirghist. Base de départ commode en un joli coin de cascades, d’herbages et de forêt. On retiendra que depuis, les temps ont changé. La piste est actuellement goudronnée, l’hébergement du montagnard lambda n’est plus possible à la MF de Tirghist, celle-ci ayant été convertie en loge de chasse (?) pour hôtes de marque. 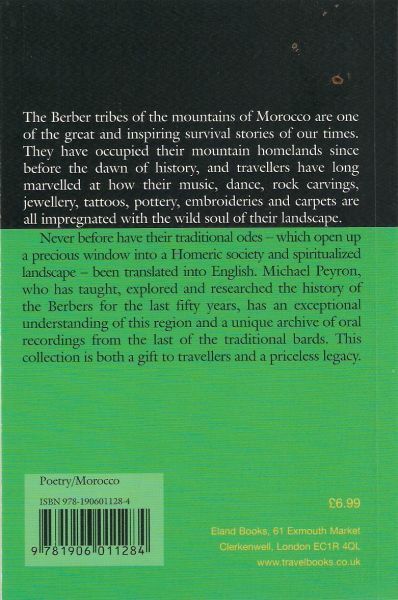 The present writer is pleased to announce the forthcoming release on the market of his translations from traditional Amazigh verse – Berber Odes: Poetry from the Atlas Mountains of Morocco, Poetry of Place series.